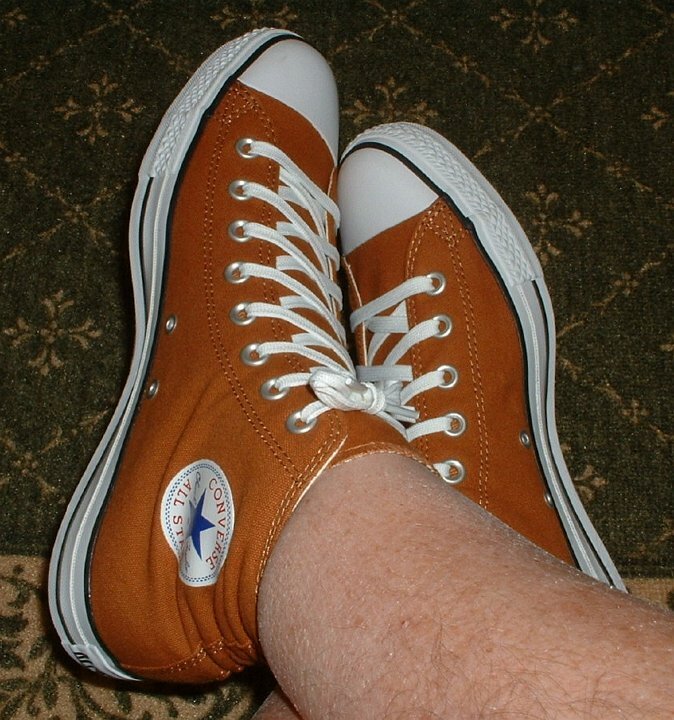 Photo gallery of brown high top chucks. 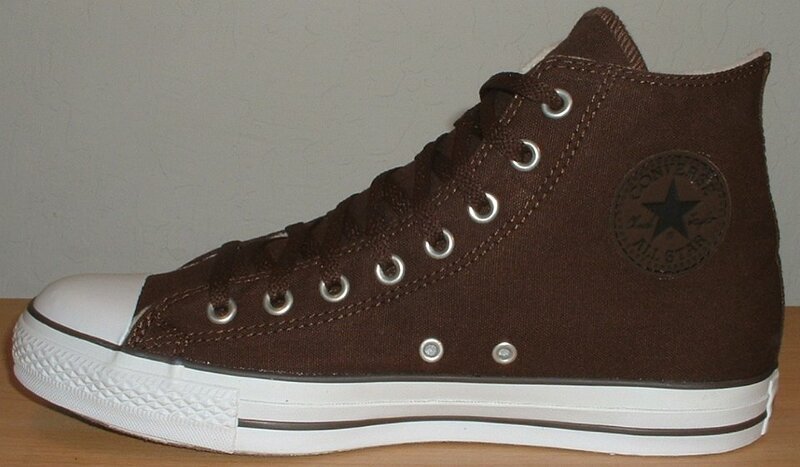 1 Brown High Top Chucks Brown high tops with black felt interior, angled side view. 2 Brown High Top Chucks New brown high tops on a fence, shot 1. 3 Brown High Top Chucks New brown high tops on a fence, shot 2. 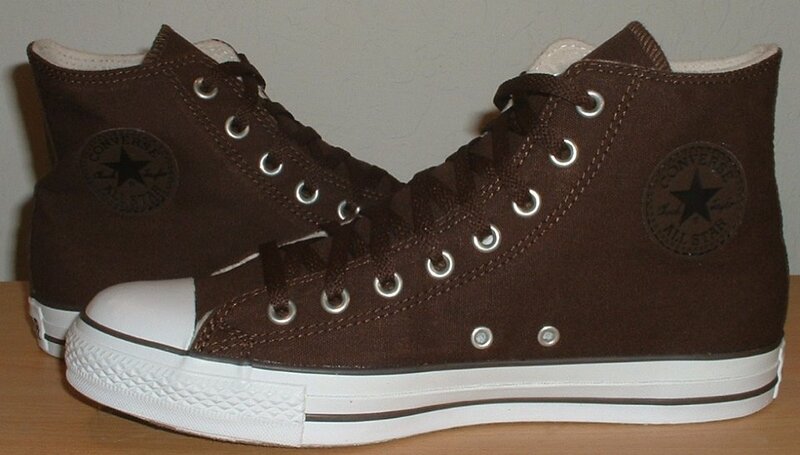 4 Brown High Top Chucks Hot chocolate brown high tops, angled side view. 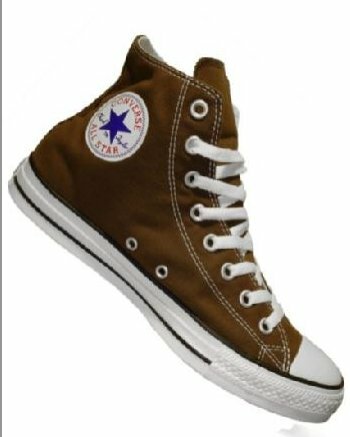 5 Brown High Top Chucks Brown and khaki high tops on fleece. 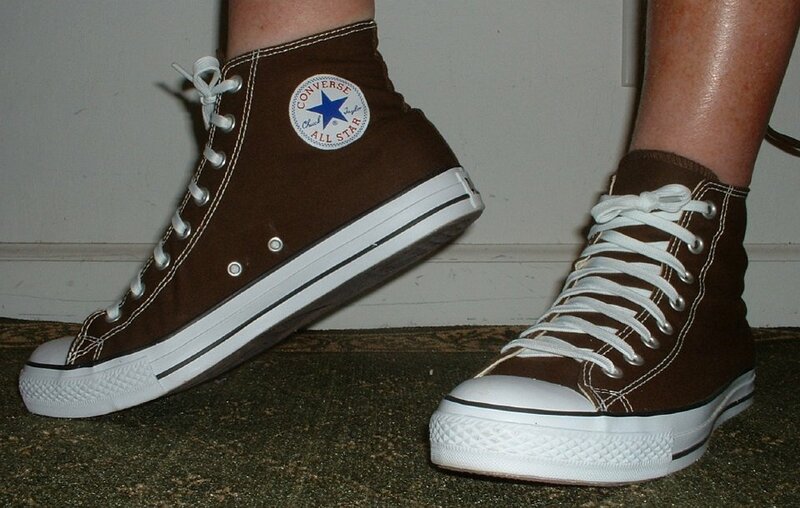 6 Brown High Top Chucks Angled side views of brown high top chucks. 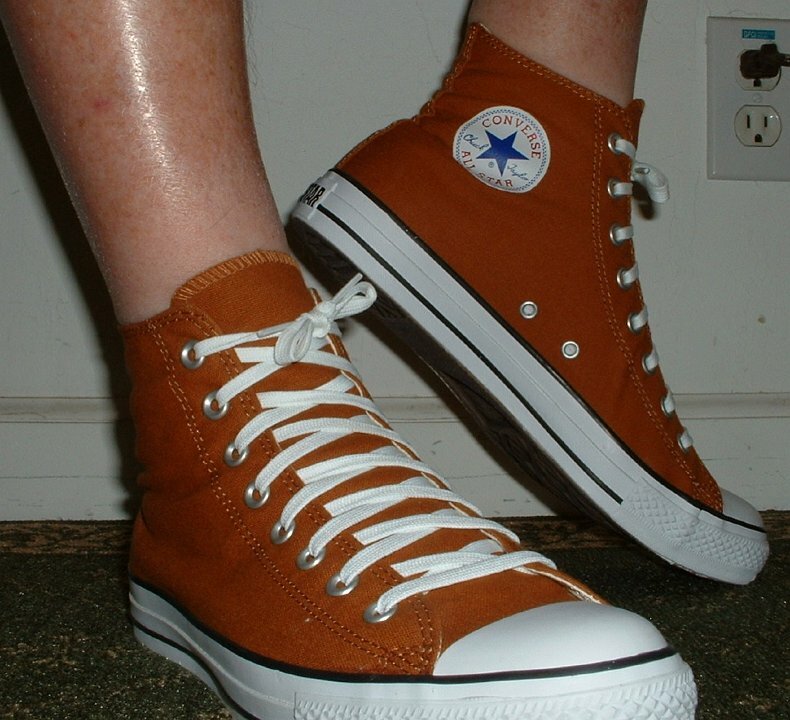 7 Brown High Top Chucks Front and rear views of brown high top chucks. 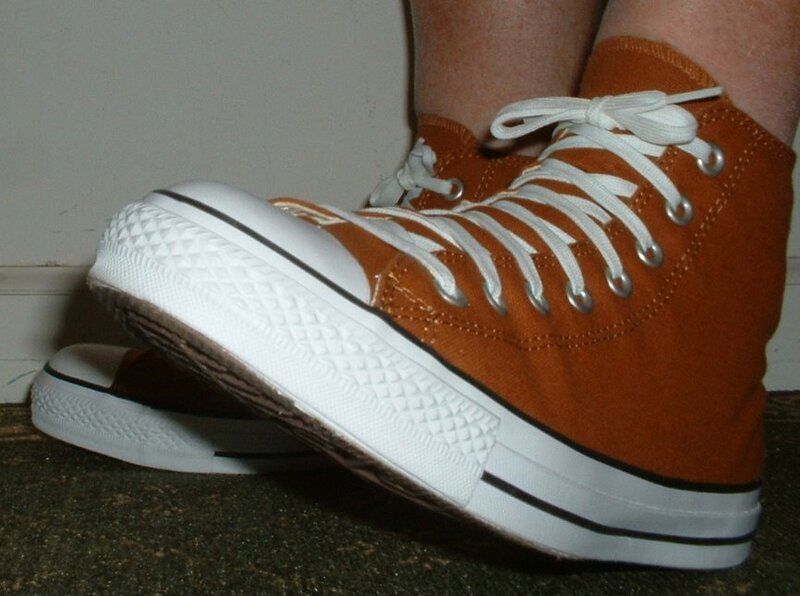 8 Brown High Top Chucks Inside patch and sole views of brown high top chucks. 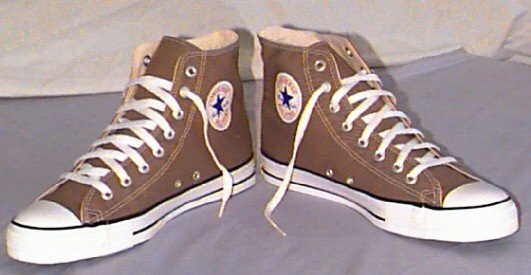 9 Brown High Top Chucks Chocolate, taupe, and flint khaki right high tops, inside patch views. 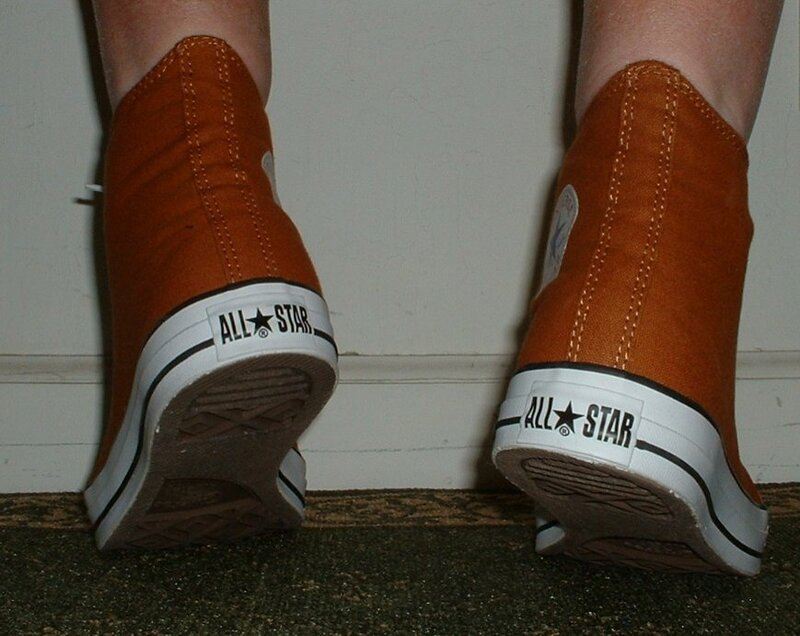 10 Brown High Top Chucks Inside patch views of chocolate, taupe, and flint khaki high tops. 11 Brown High Top Chucks Inside patch view of a worn right brown high top chuck. 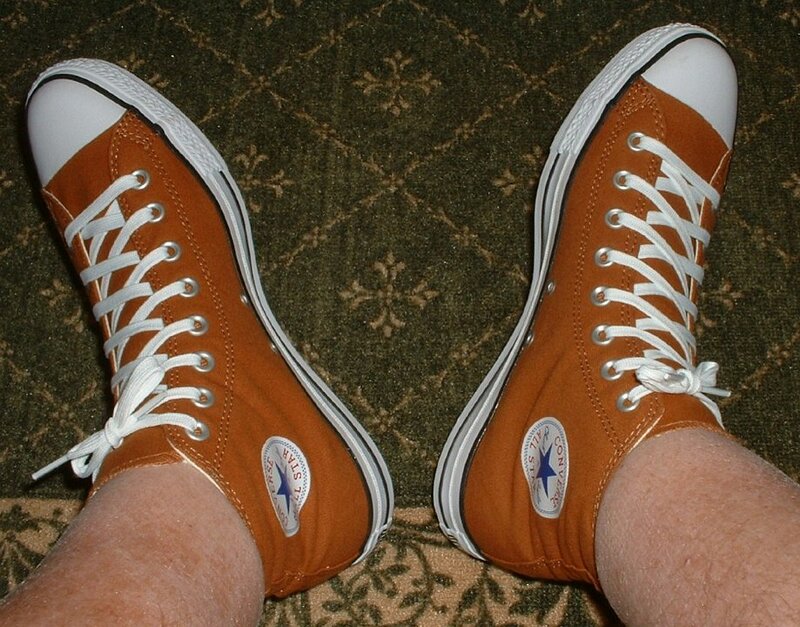 12 Brown High Top Chucks Brown high tops with the Chuck Talylor ankle patch logo. 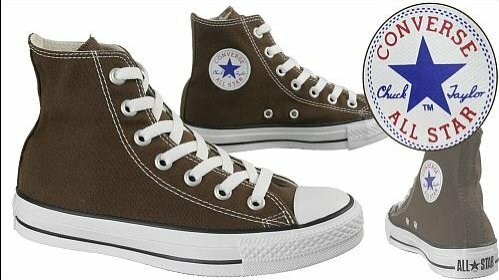 13 Brown High Top Chucks Left brown and Carolina blue 2-tone high top, inside patch view. 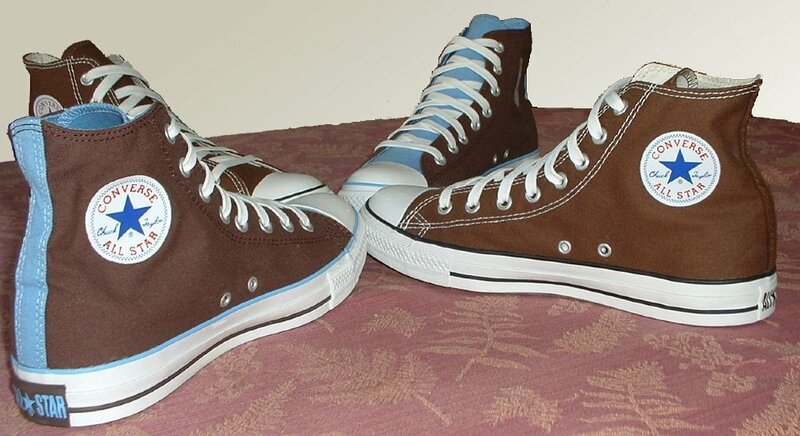 14 Brown High Top Chucks Left brown and Carolina blue 2-tone high top, outside view. 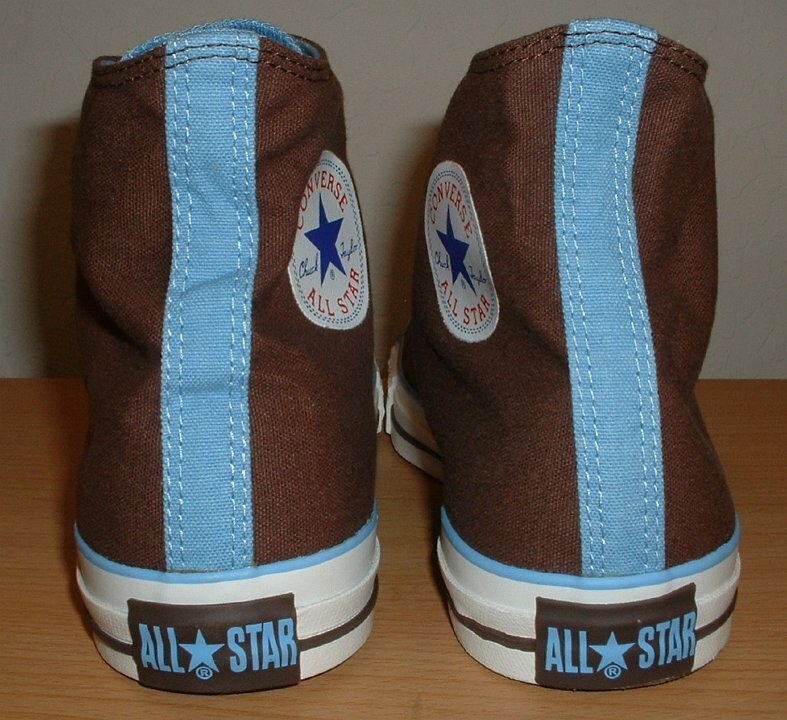 15 Brown High Top Chucks Right brown and Carolina blue 2-tone high top, inside patch view. 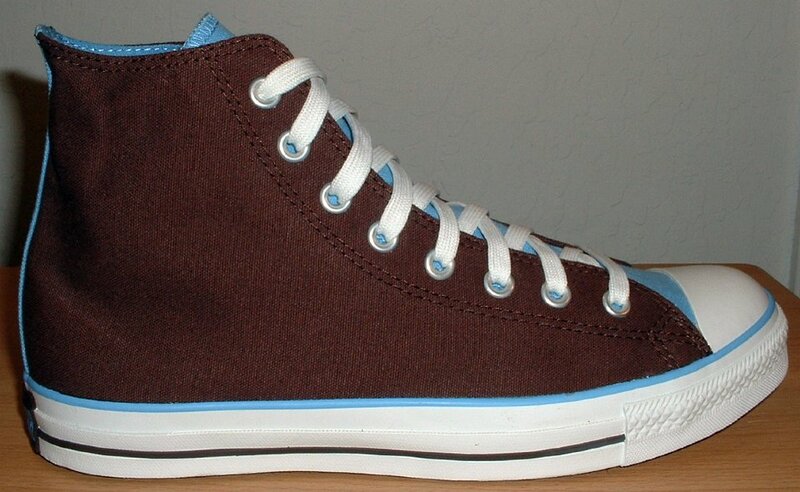 16 Brown High Top Chucks Right brown and Carolina blue 2-tone high top, outside view. 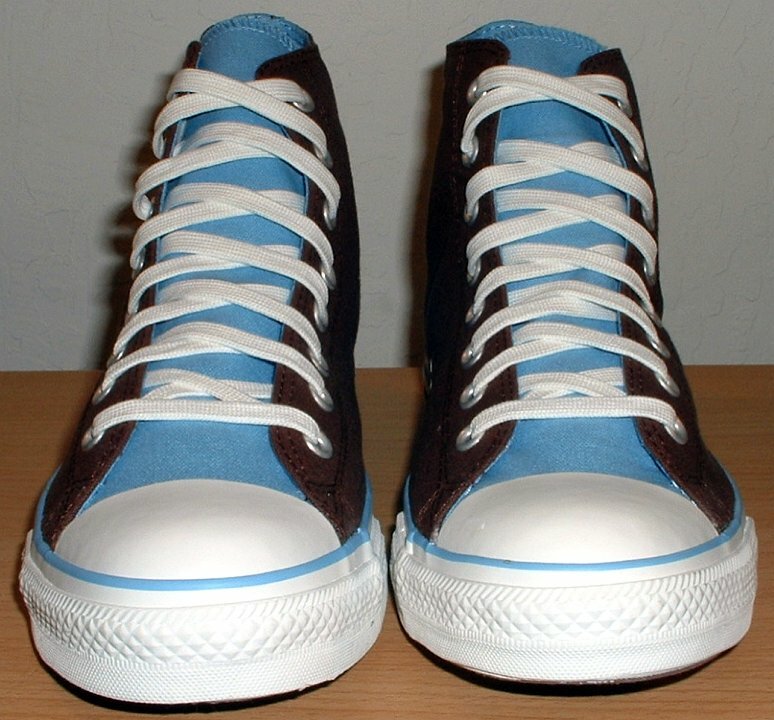 17 Brown High Top Chucks Brown and Carolina blue 2-tone high tops, front view. 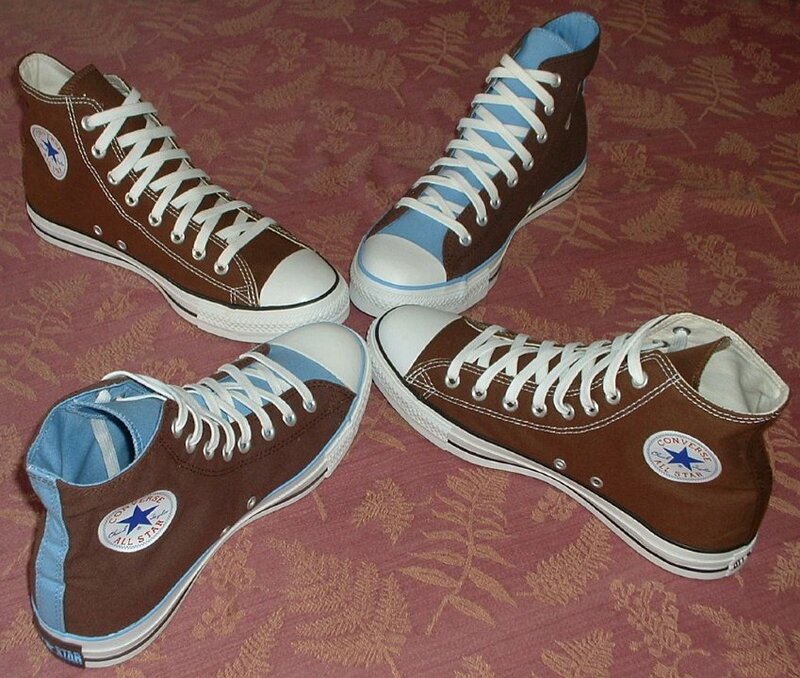 18 Brown High Top Chucks Brown and Carolina blue 2-tone high tops, angled front and top view. 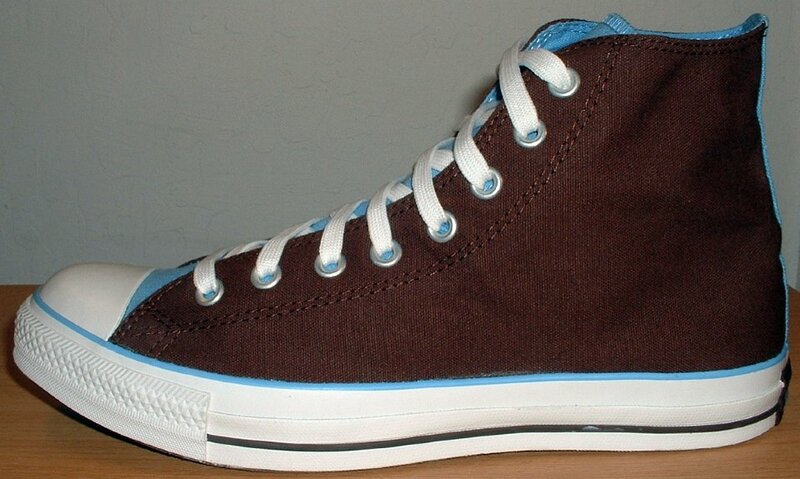 19 Brown High Top Chucks Brown and Carolina blue 2-tone high tops, top view. 20 Brown High Top Chucks Brown and Carolina blue 2-tone high tops, rear view. 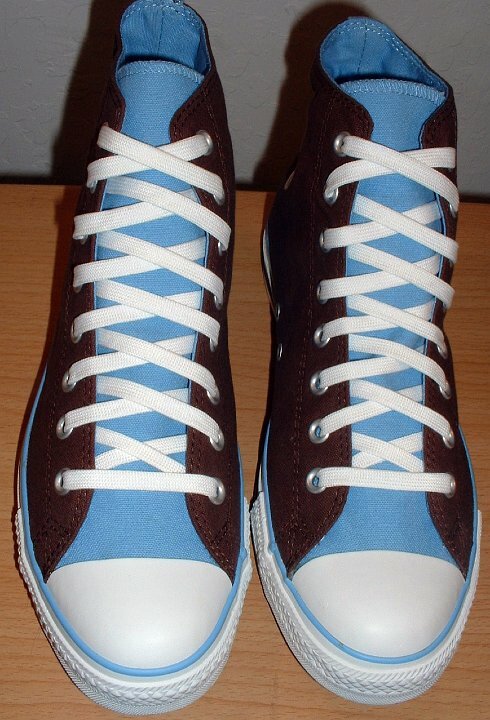 21 Brown High Top Chucks Brown and Carolina blue 2-tone high tops, angled front view. 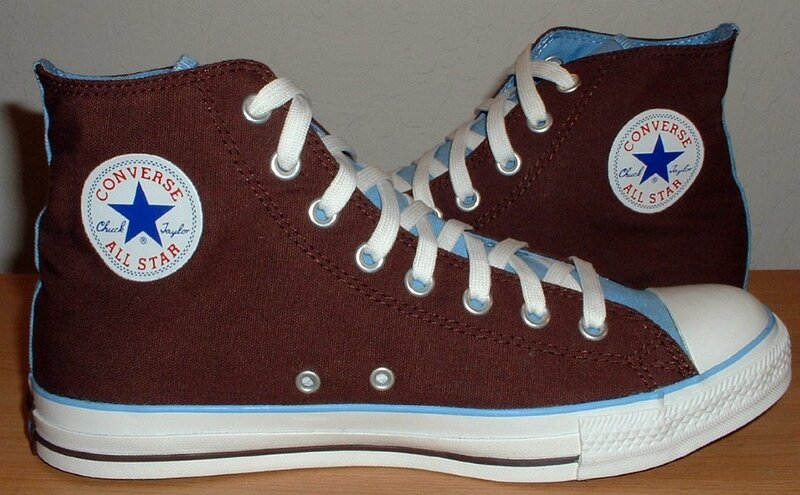 22 Brown High Top Chucks Brown and Carolina blue 2-tone high tops, inside patch views. 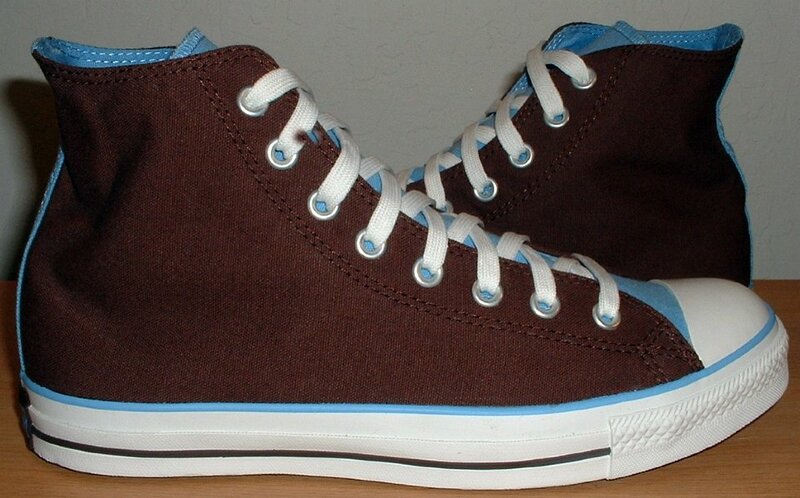 23 Brown High Top Chucks Brown and Carolina blue 2-tone high tops, outside view. 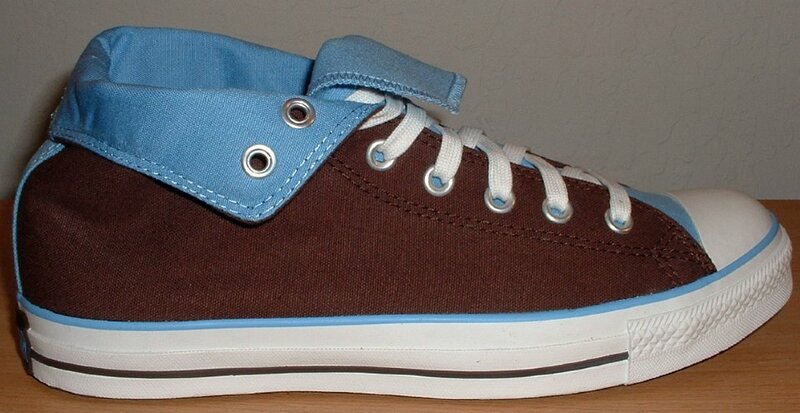 24 Brown High Top Chucks Brown and Carolina blue 2-tone high tops, Inside patch and sole views. 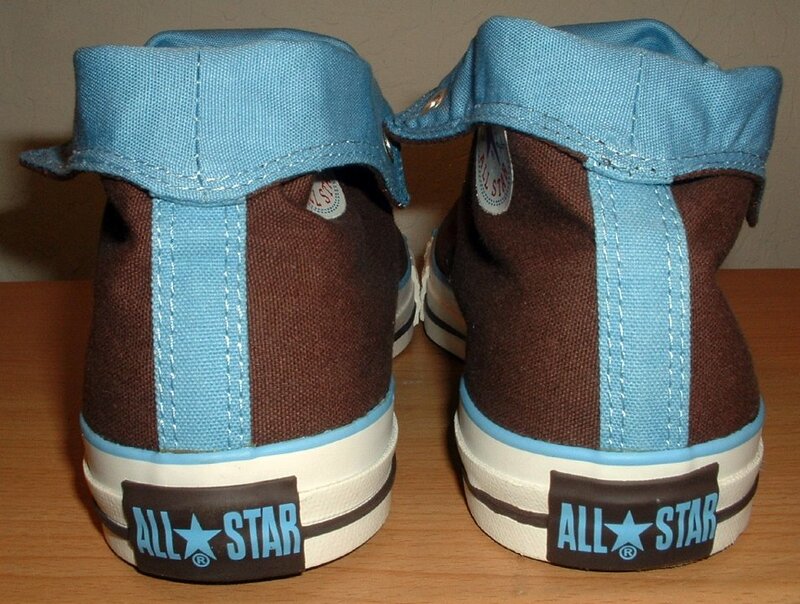 25 Brown High Top Chucks Rolled down right brown and Carolina blue 2-tone high top, inside patch view. 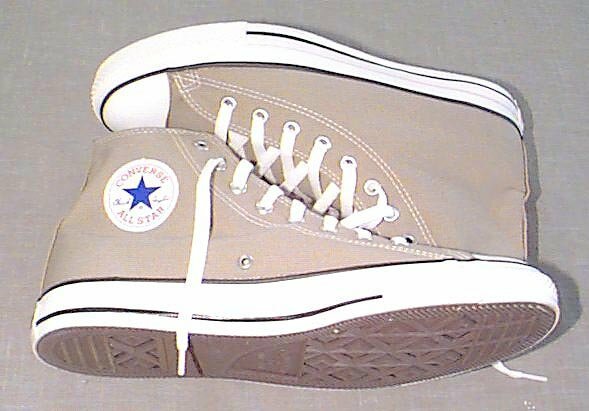 26 Brown High Top Chucks Rolled down right brown and Carolina blue 2-tone high top, outside view. 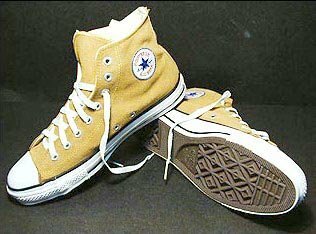 27 Brown High Top Chucks Rolled down left brown and Carolina blue 2-tone high top, outside view. 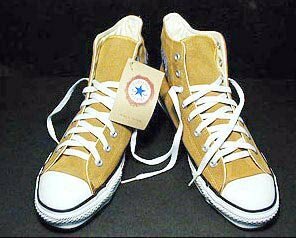 28 Brown High Top Chucks Rolled down left brown and Carolina blue 2-tone high top, inside patch view. 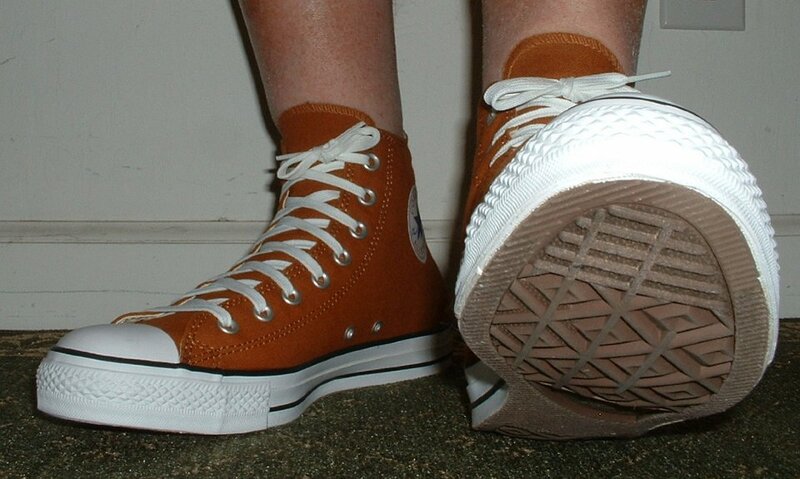 29 Brown High Top Chucks Rear view of rolled down brown and Carolina blue 2-tone high tops. 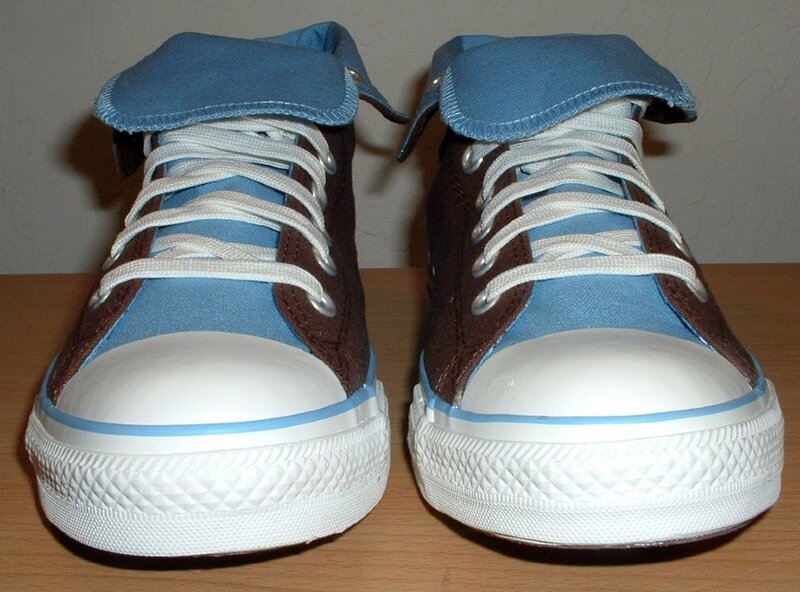 30 Brown High Top Chucks Front view of rolled down brown and Carolina blue 2-tone high tops. 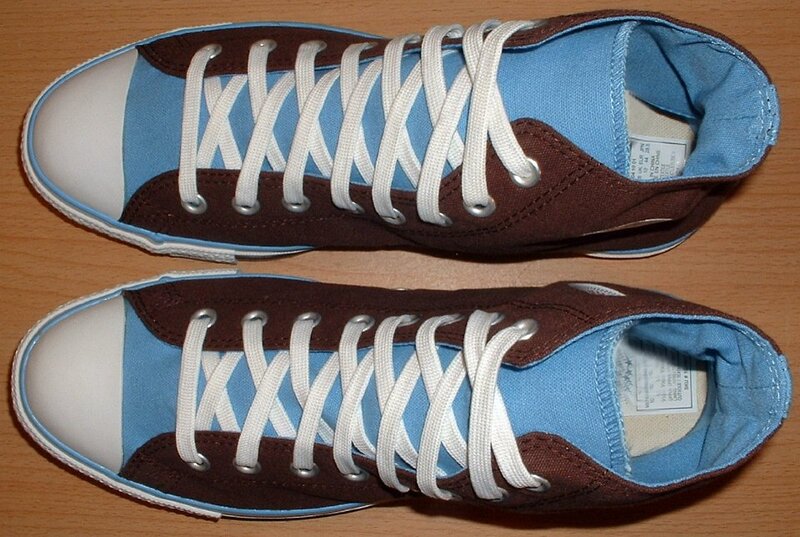 31 Brown High Top Chucks Angled front view of rolled down brown and Carolina blue 2-tone high tops. 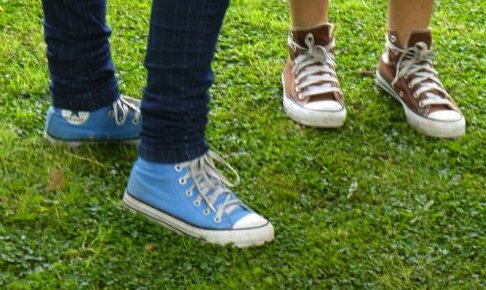 32 Brown High Top Chucks Top view of rolled down brown and Carolina blue 2-tone high tops. 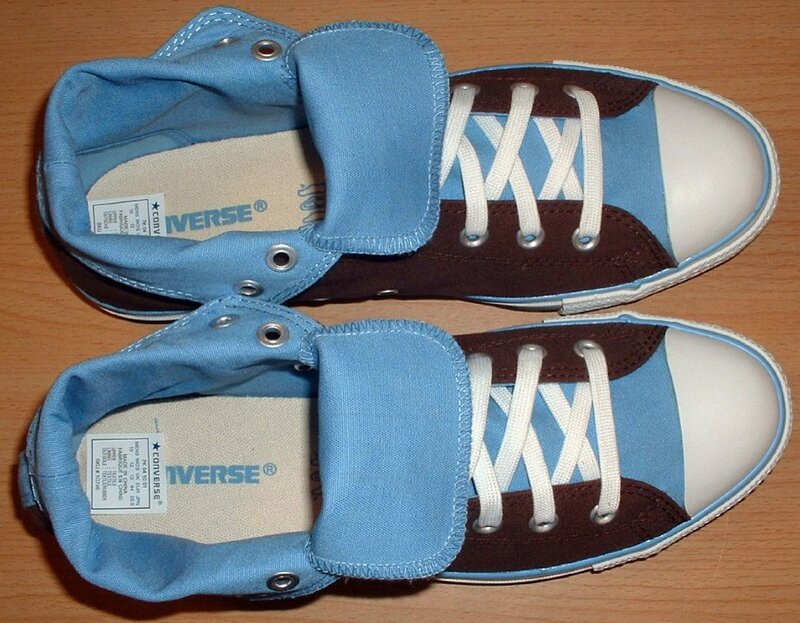 33 Brown High Top Chucks Inside patch and sole views of rolled down brown and Carolina blue 2-tone high tops. 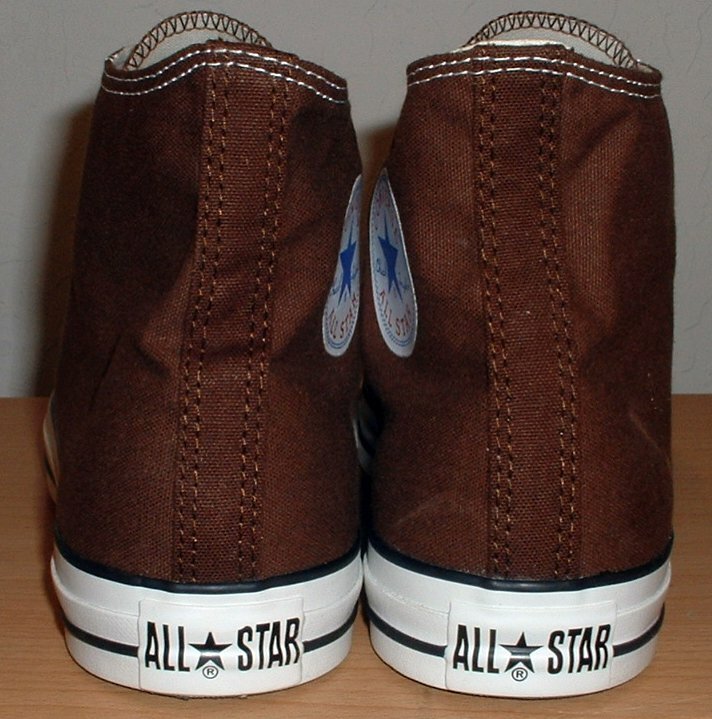 34 Brown High Top Chucks Right brown and parchment fleece high top, inside patch view. 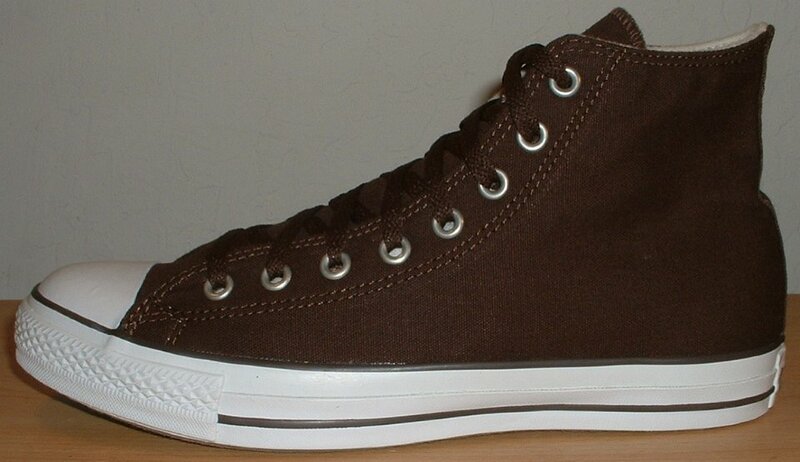 35 Brown High Top Chucks Right brown and parchment fleece high top, outside view. 36 Brown High Top Chucks Left brown and parchment fleece high top, inside patch view. 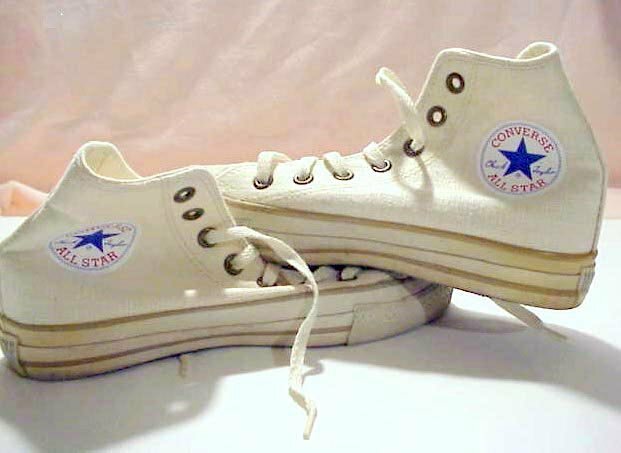 37 Brown High Top Chucks Right brown and parchment fleece high top, outside view. 38 Brown High Top Chucks Brown and parchment fleece high tops, rear view. 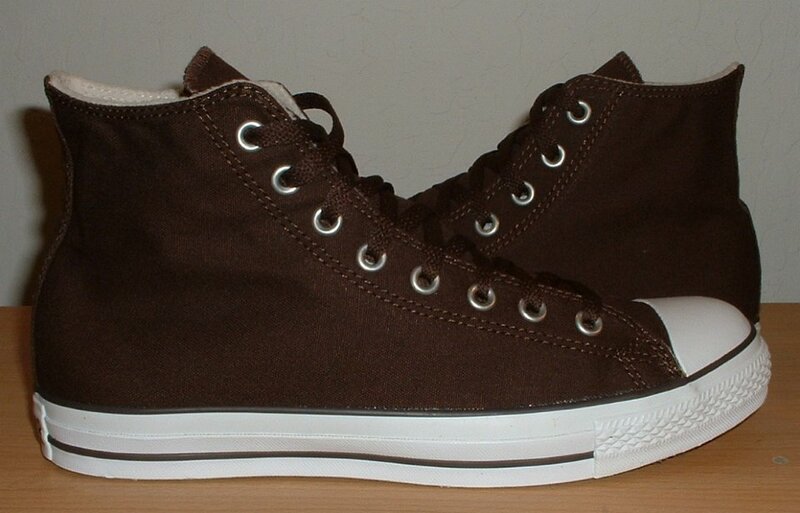 39 Brown High Top Chucks Brown and parchment fleece high tops, front view. 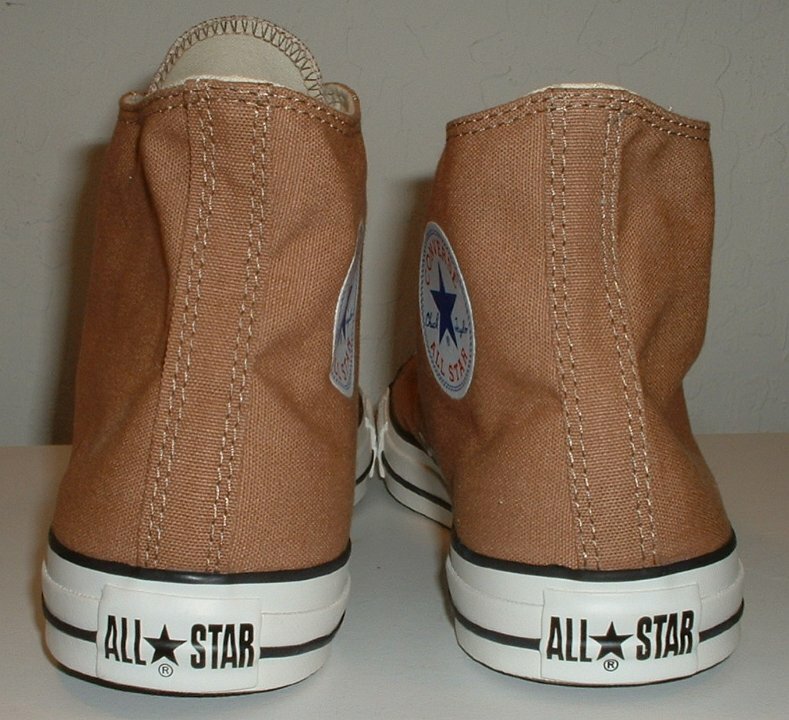 40 Brown High Top Chucks Brown and parchment fleece high tops, top view. 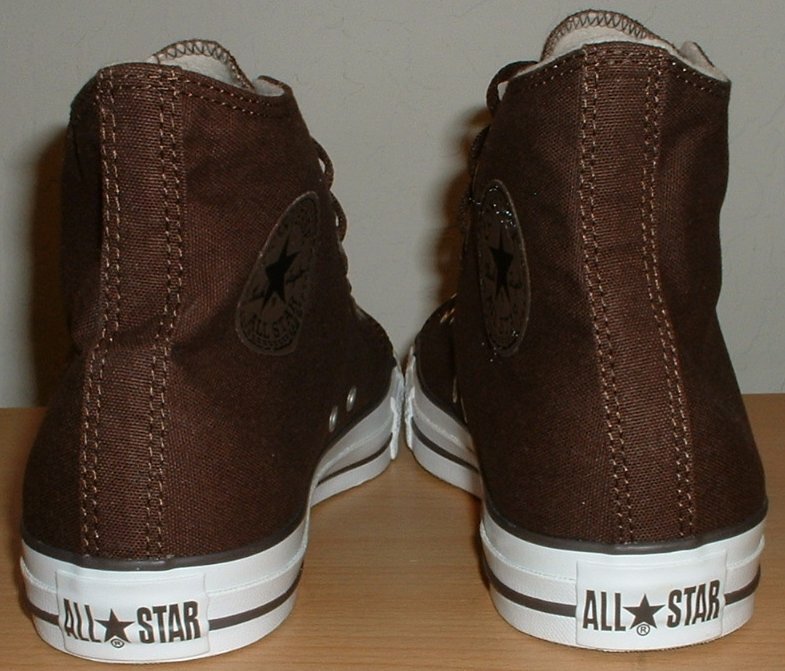 41 Brown High Top Chucks Brown and parchment fleece high tops, inside patch views. 42 Brown High Top Chucks Brown and parchment fleece high tops, ioutside views. 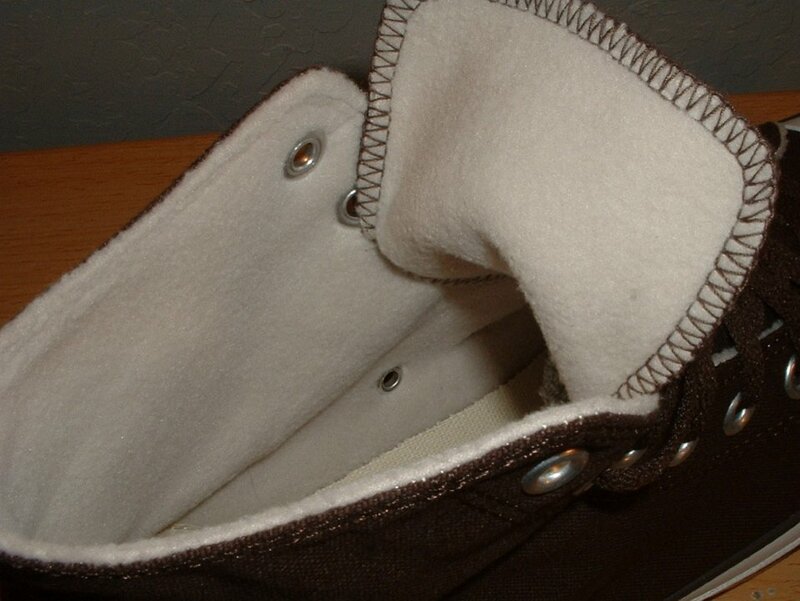 43 Brown High Top Chucks Brown and parchment fleece high tops, closeup of the fleece lining. 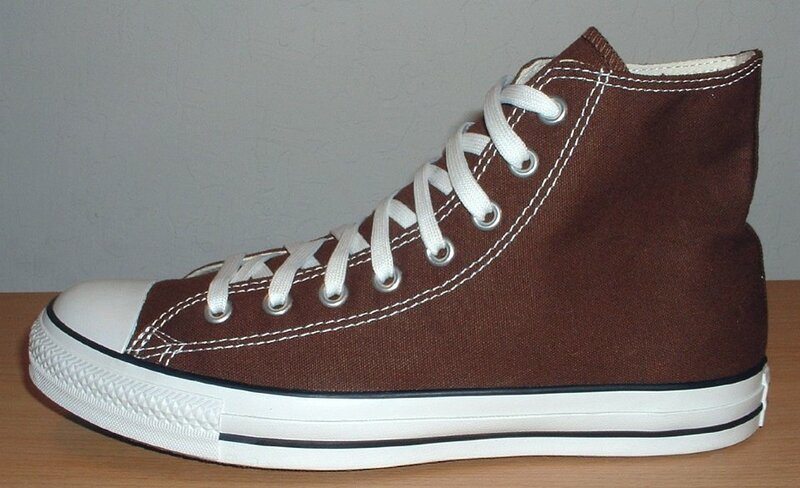 44 Brown High Top Chucks Brown and parchment fleece high tops, inside patch and sole views. 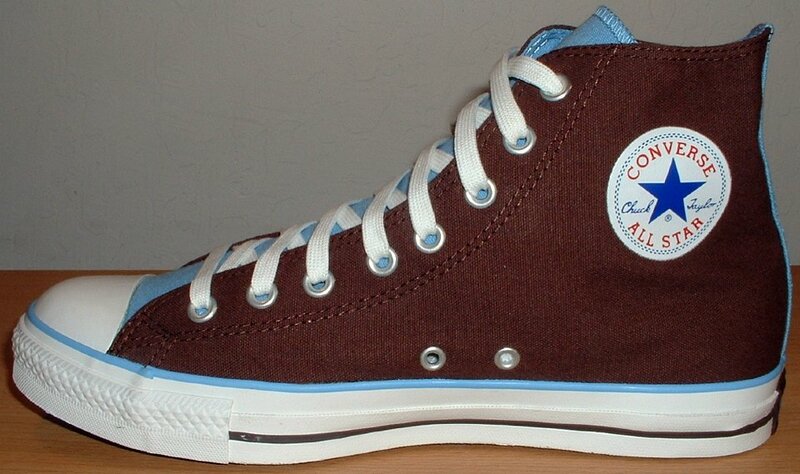 45 Brown High Top Chucks Wheel of chocolate brown and brown/Carolina blue 2-tone high tops, shot 1. 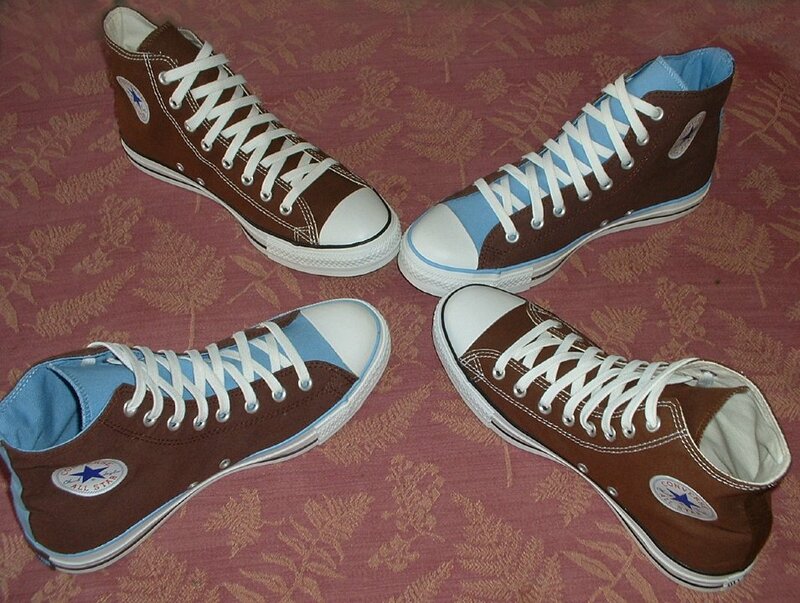 46 Brown High Top Chucks Wheel of chocolate brown and brown/Carolina blue 2-tone high tops, shot 2. 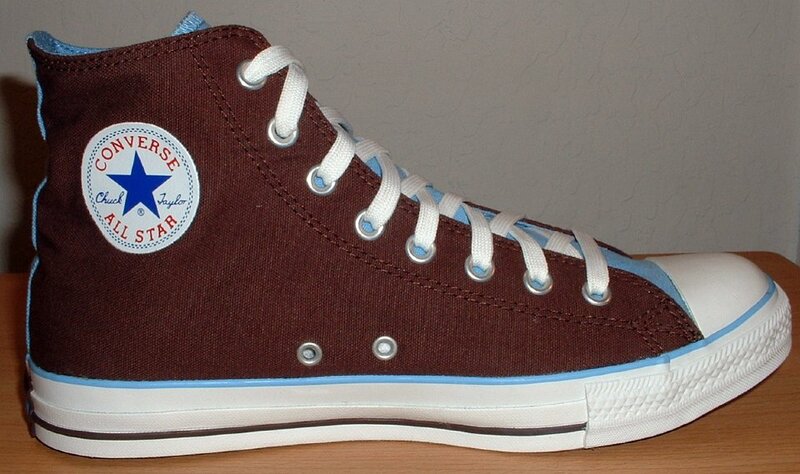 47 Brown High Top Chucks Wheel of chocolate brown and brown/Carolina blue 2-tone high tops, shot 3. 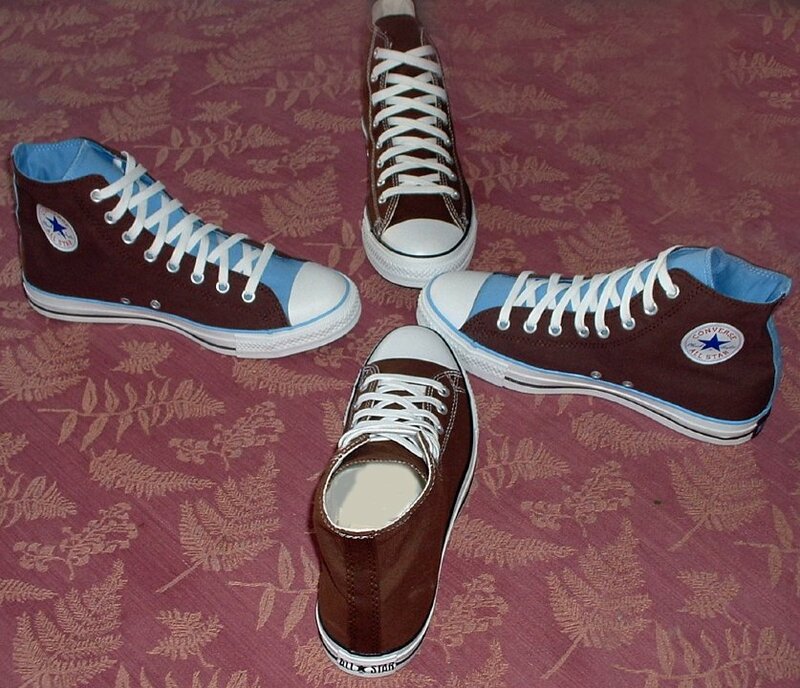 48 Brown High Top Chucks Wheel of chocolate brown and brown/Carolina blue 2-tone high tops, shot 4. 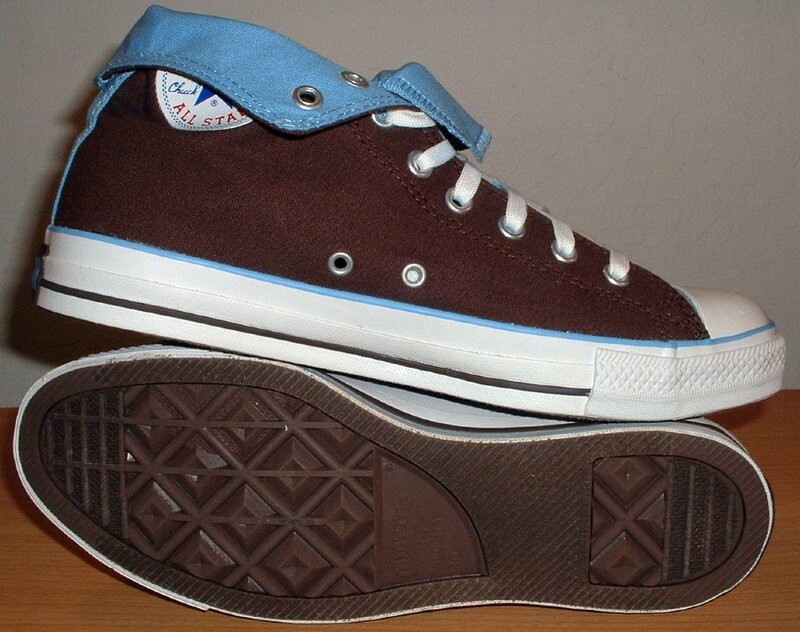 49 Brown High Top Chucks Wheel of chocolate brown and brown/Carolina blue 2-tone high tops, shot 5. 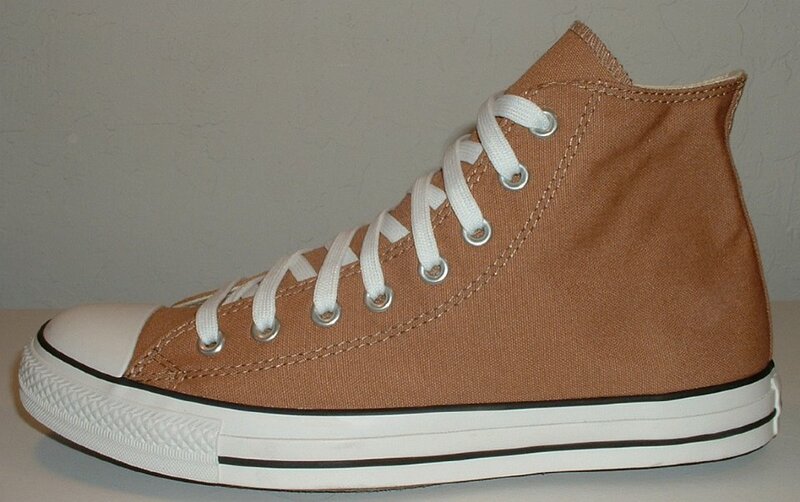 50 Brown High Top Chucks New camel suede high tops with tag, top view. 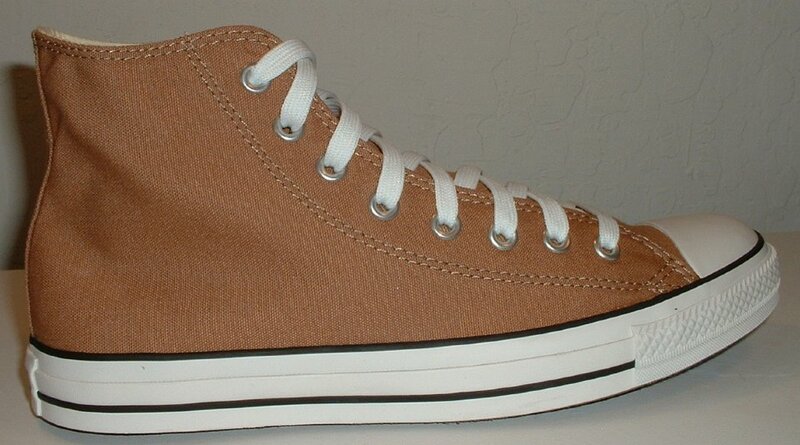 51 Brown High Top Chucks Camel suede high tops, outside and partial sole views. 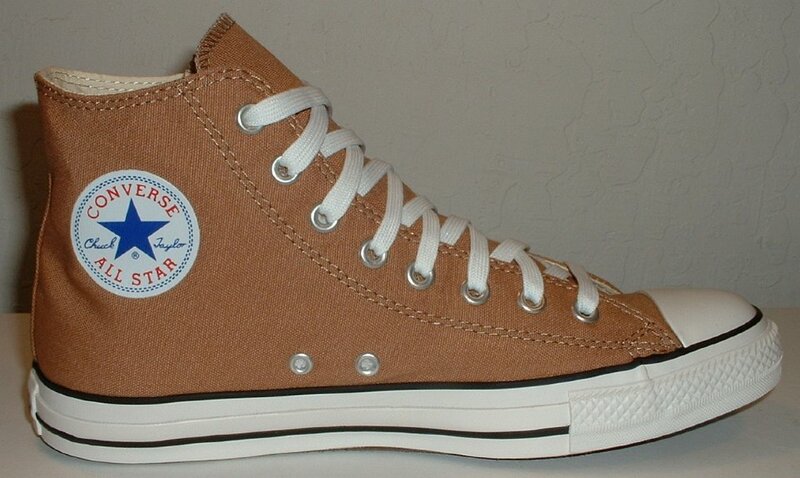 52 Brown High Top Chucks Camel suede high tops, inside patch and sole views. 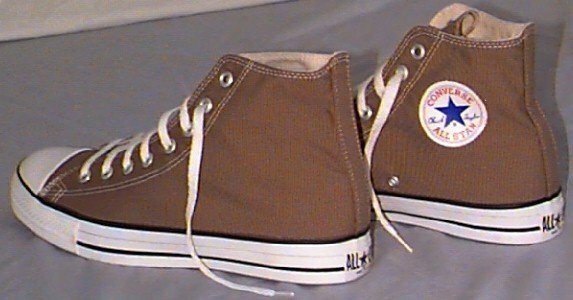 53 Brown High Top Chucks Camel suede high tops, top and partial side patch views. 54 Brown High Top Chucks Chino high top, left inside patch view. 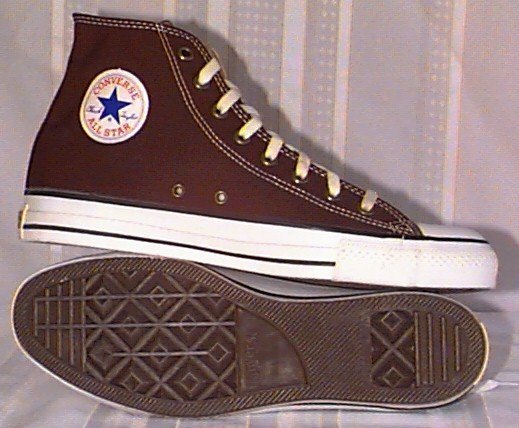 55 Brown High Top Chucks Inside patch view of a left made in USA chocolate brown high top. 56 Brown High Top Chucks Inside patch view of a right made in USA chocolate brown high top. 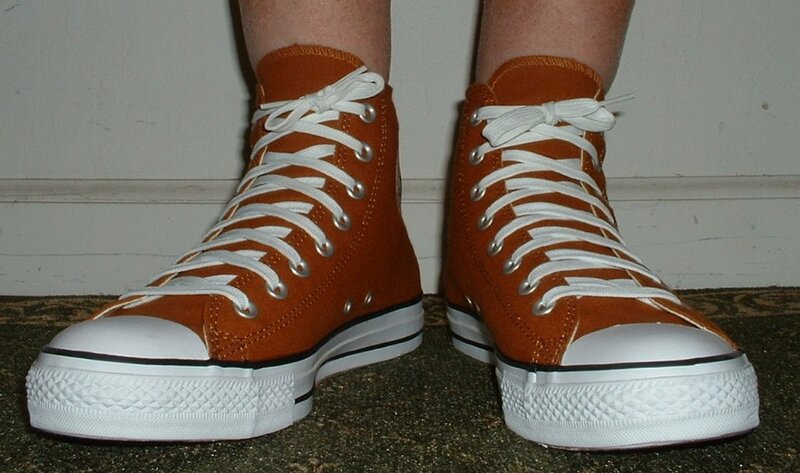 57 Brown High Top Chucks Angled front view of made in USA chocolate brown high top chucks. 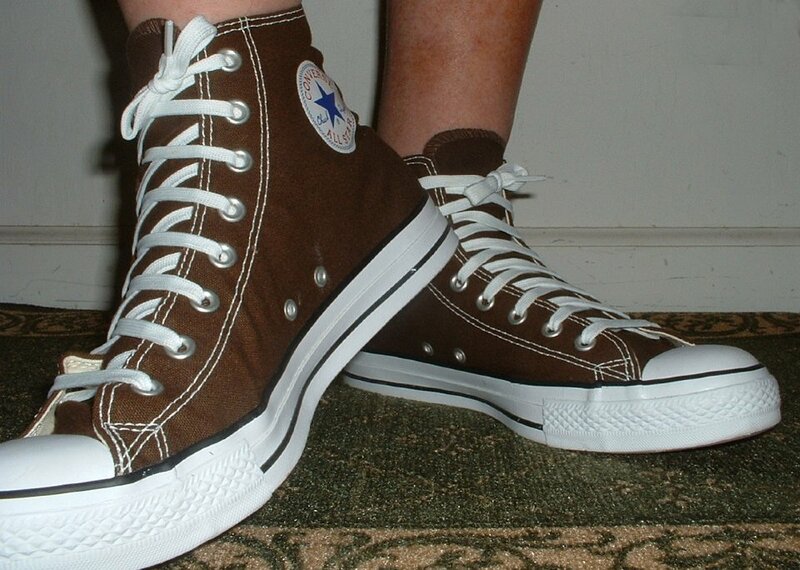 58 Brown High Top Chucks Front view of made in USA chocolate brown high top chucks. 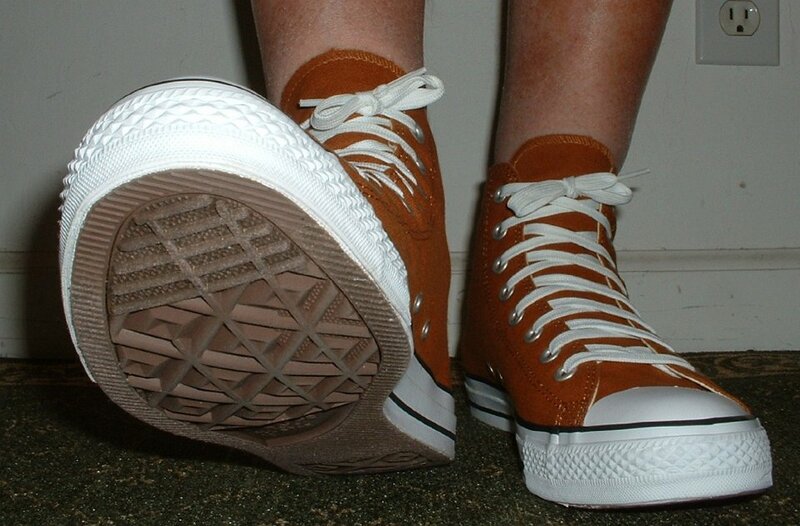 59 Brown High Top Chucks Rear view of made in USA chocolate brown high top chucks. 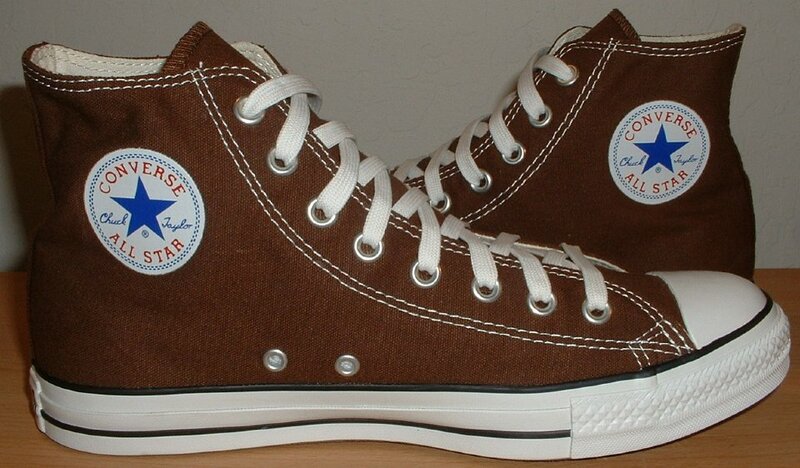 60 Brown High Top Chucks Inside patch and sole views of made in USA chocolate brown high top chucks. 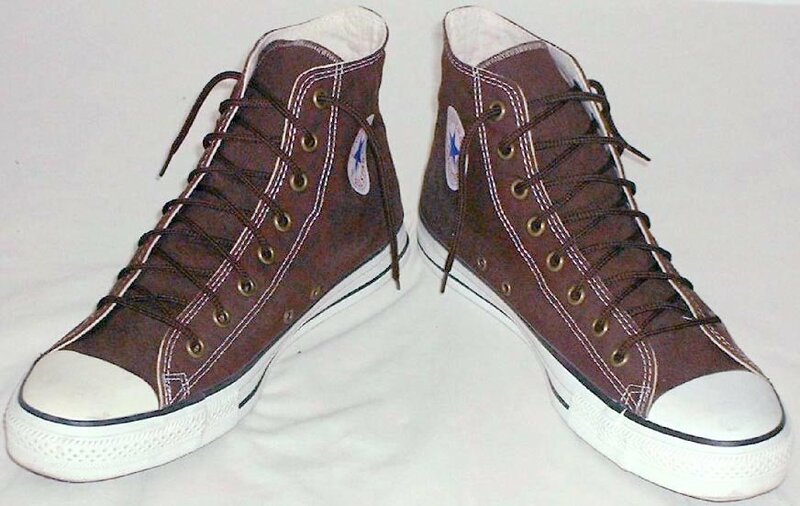 61 Brown High Top Chucks Right side view of made in USA chocolate brown high top chucks. 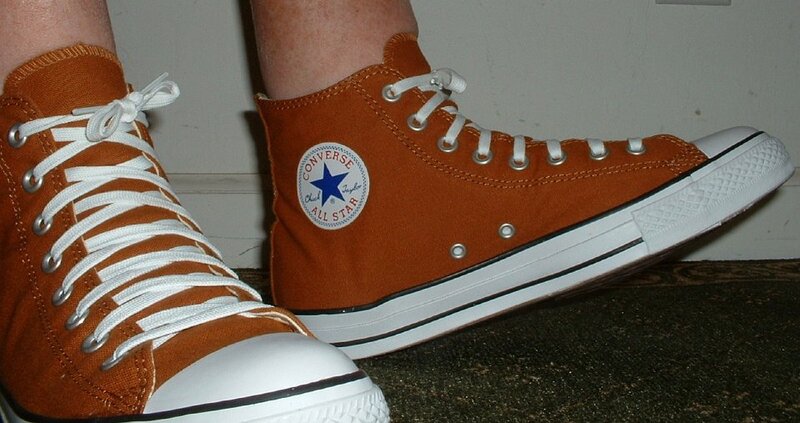 62 Brown High Top Chucks Outside views of made in USA chocolate brown high top chucks. 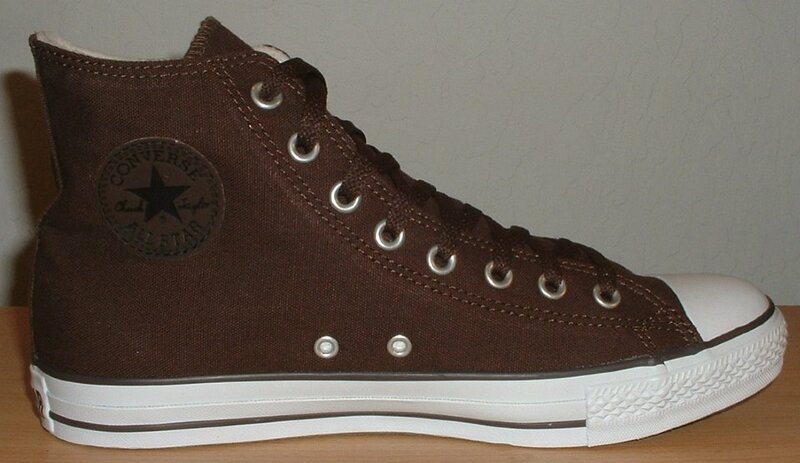 63 Brown High Top Chucks Chocolate brown high tops with black felt interior, angled side view. 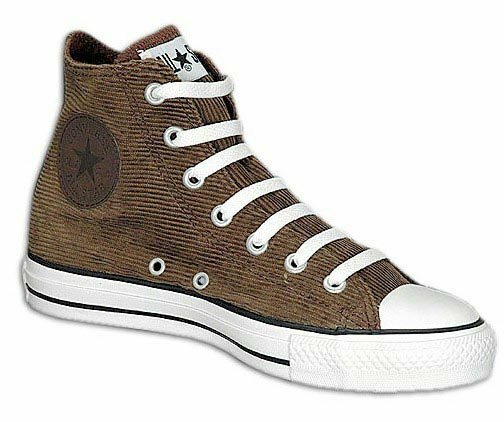 64 Brown High Top Chucks Chocolate brown high tops with black felt interior, front and rear views. 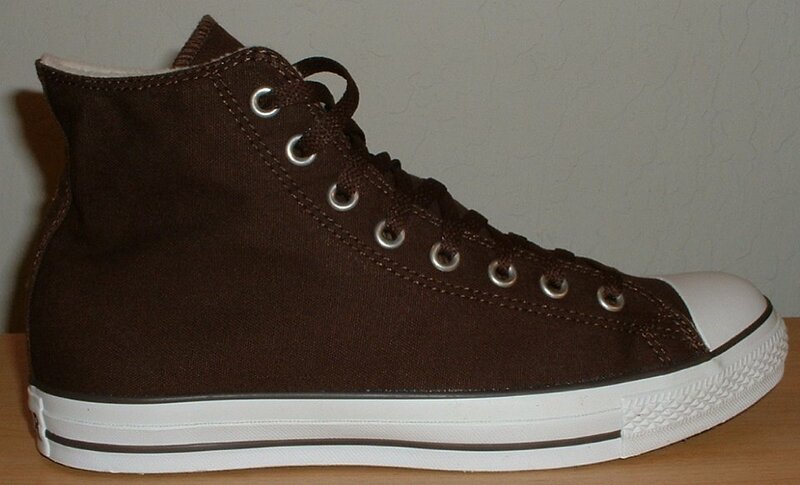 65 Brown High Top Chucks Chocolate brown high tops with black felt interior, inside patch and sole views. 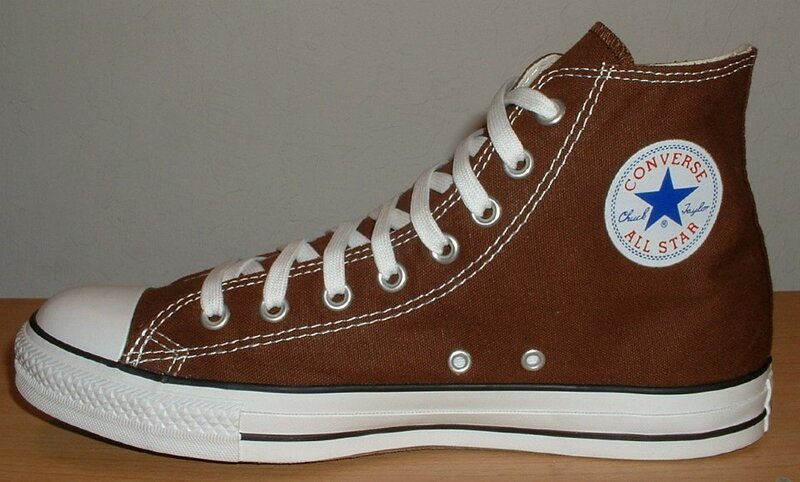 66 Brown High Top Chucks Right made in USA chocolate brown high top with brown narrow laces, inside patch view. 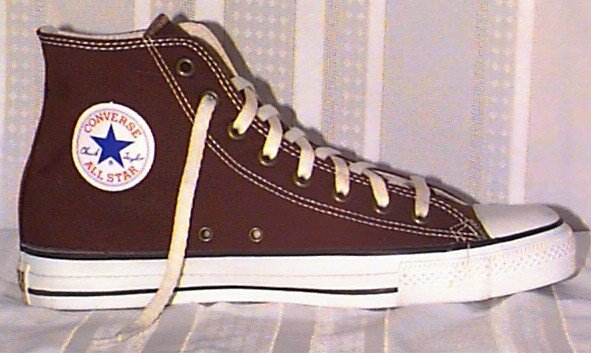 67 Brown High Top Chucks Chocolate brown high tops with brown narrow laces, inside patch views. 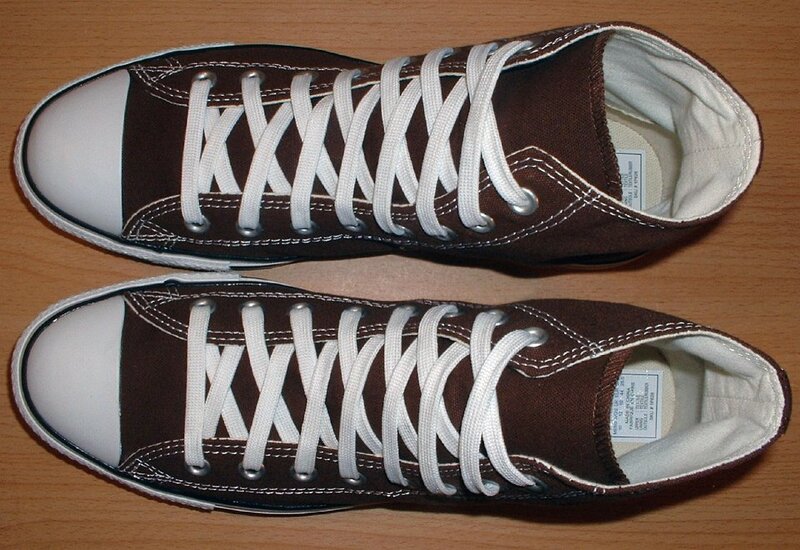 68 Brown High Top Chucks Made in USA chocolate brown high tops with brown narrow round laces, angled front view. 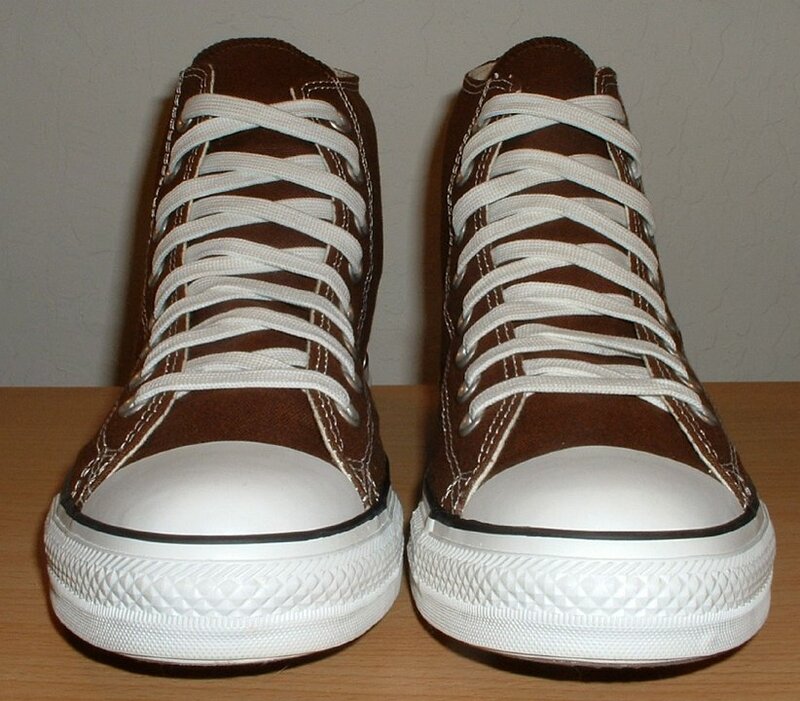 69 Brown High Top Chucks Chocolate brown high tops with narrow round brown laces, inside patch and sole views. 70 Brown High Top Chucks Inside patch view of a right chocolate brown high top. 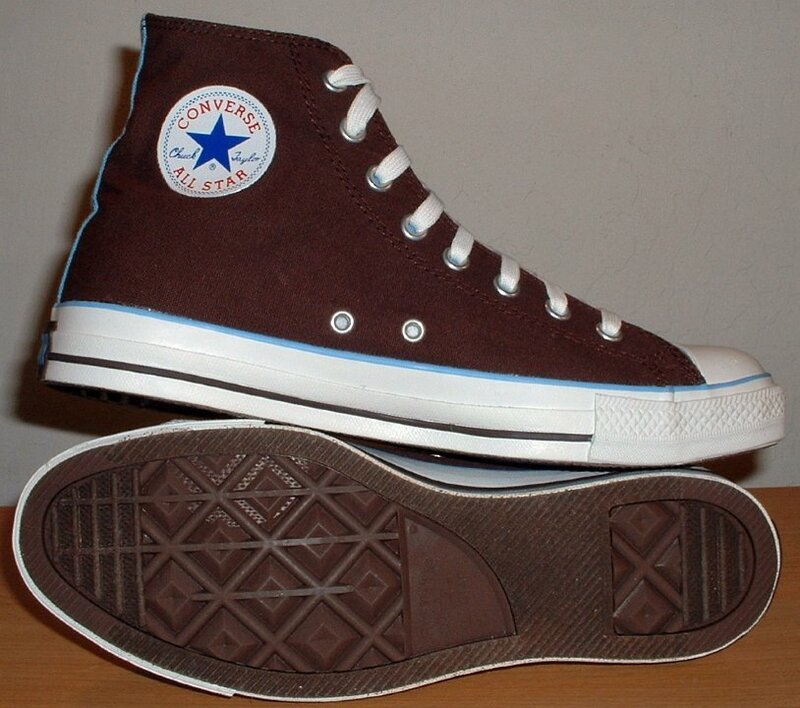 71 Brown High Top Chucks Outside view of a right chocolate brown high top. 72 Brown High Top Chucks Inside patch view of a left chocolate brown high top. 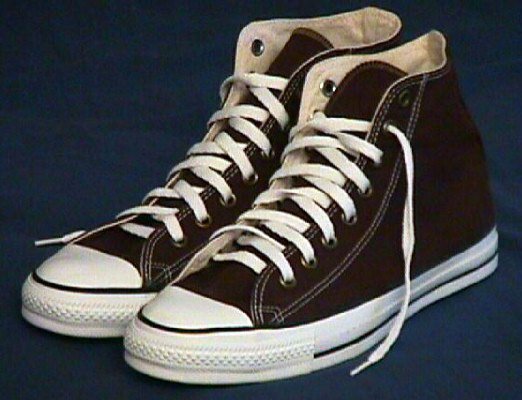 73 Brown High Top Chucks Outside view of a left chocolate brown high top. 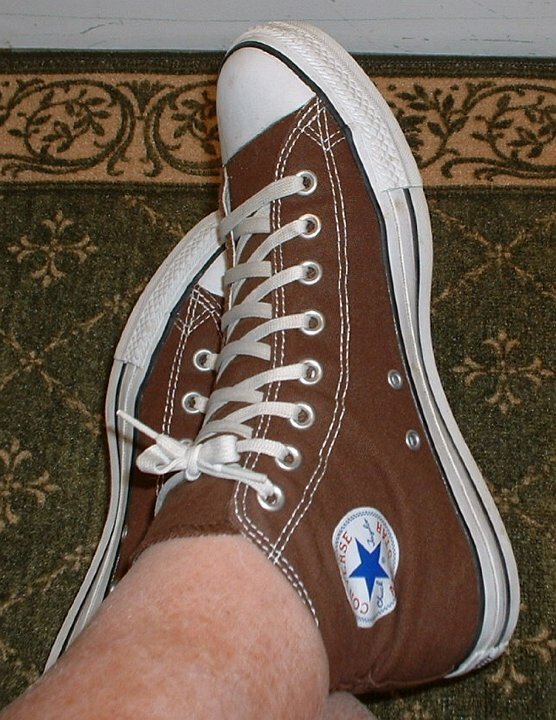 74 Brown High Top Chucks Top view of chocolate brown high tops. 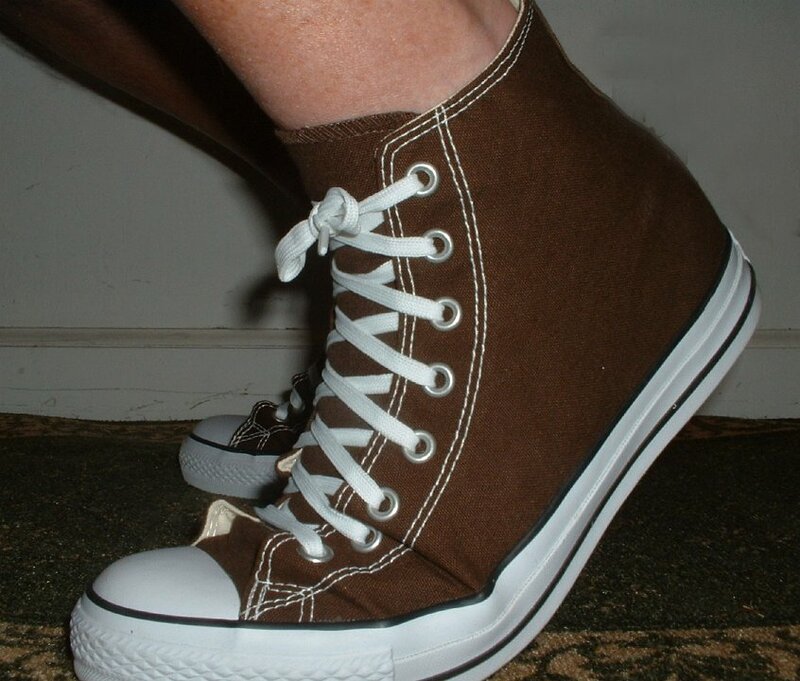 75 Brown High Top Chucks Front view of chocolate brown high tops. 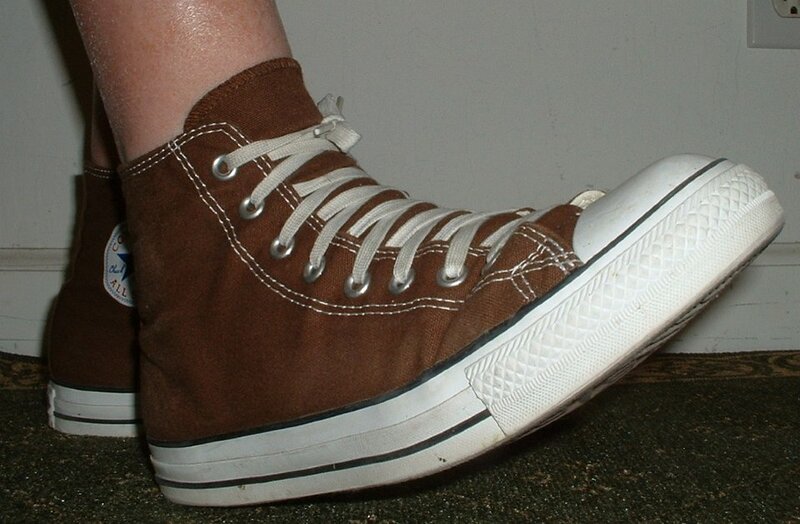 76 Brown High Top Chucks Angled front view of chocolate brown high tops. 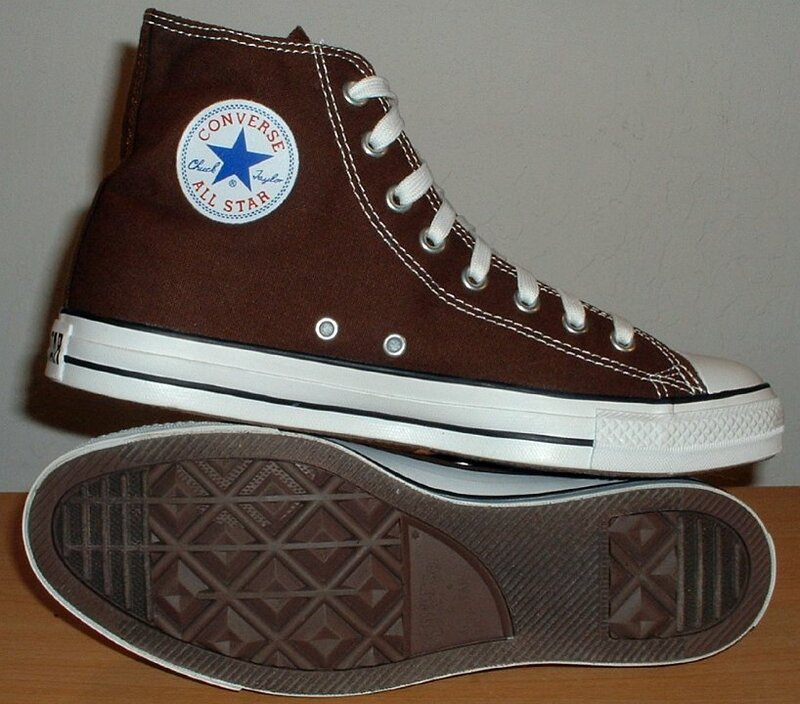 77 Brown High Top Chucks Rear view of chocolate brown high tops. 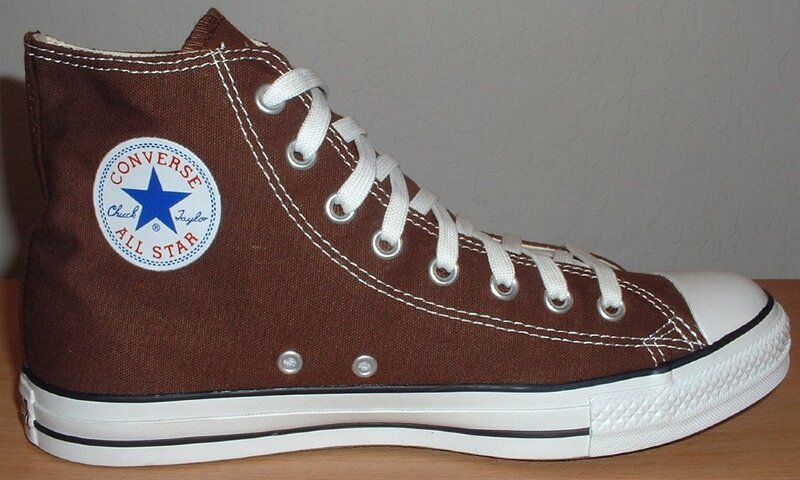 78 Brown High Top Chucks Inside patch views of chocolate brown high tops. 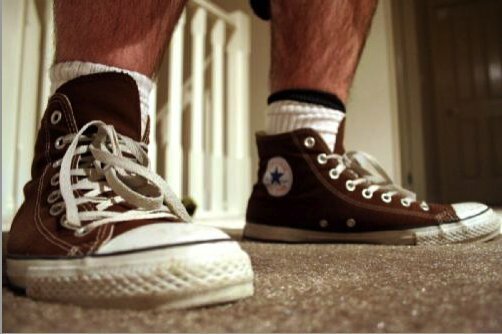 79 Brown High Top Chucks Outside views of chocolate brown high tops. 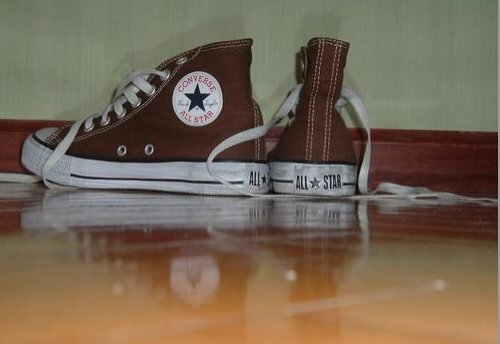 80 Brown High Top Chucks Inside patch and sole views of chocolate brown high tops. 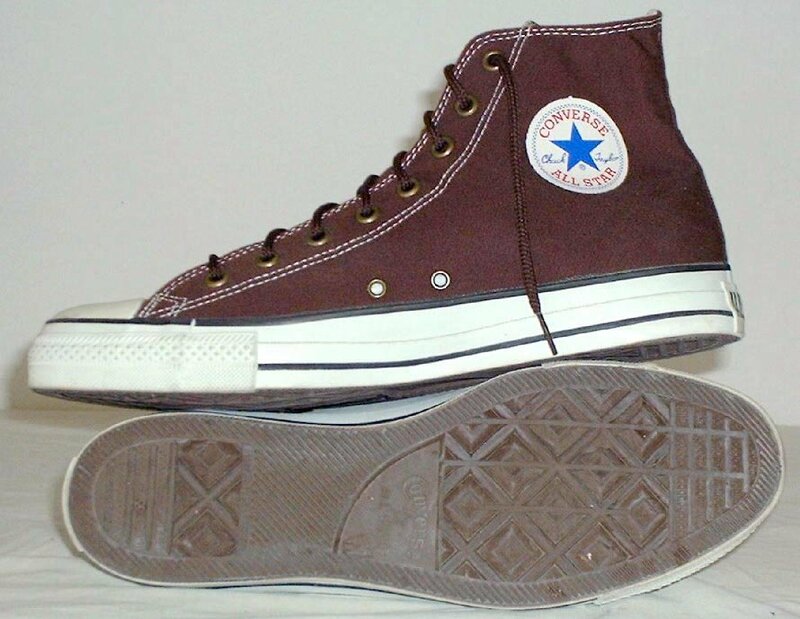 81 Brown High Top Chucks Angled front and top view of chocolate brown high tops. 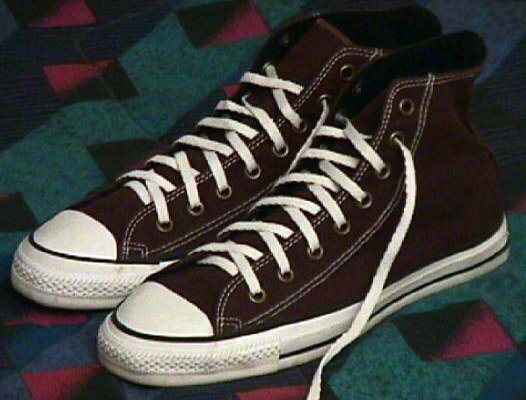 82 Brown High Top Chucks Inside patch and rear view of chocolate brown high top chucks. 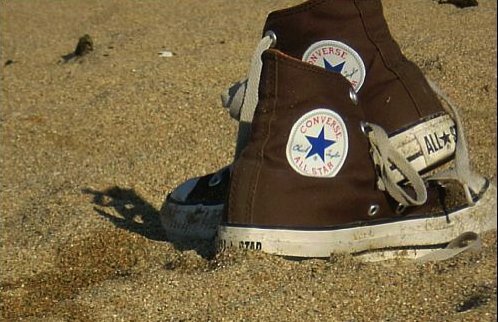 83 Brown High Top Chucks Inside patch view of chocolate brown high top chucks on the beach. 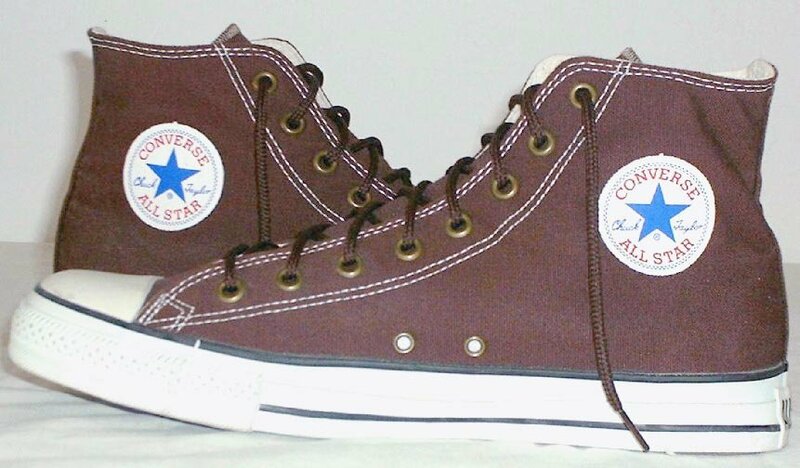 84 Brown High Top Chucks Catalog shot of a left chocolate brown high top. 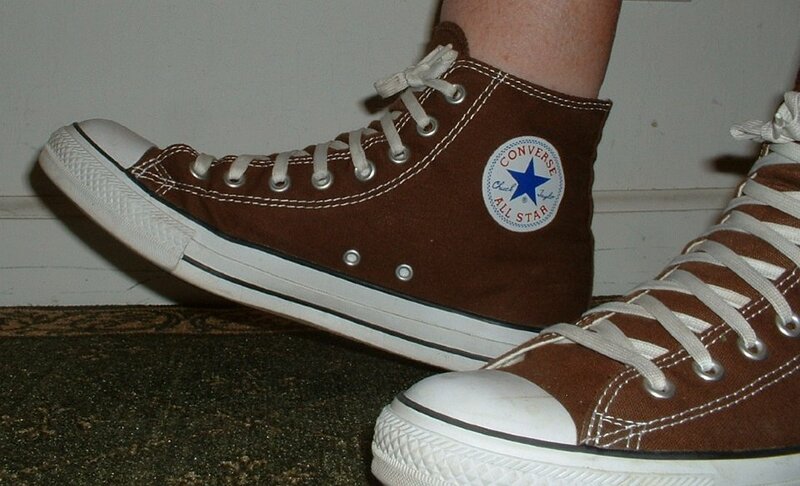 85 Brown High Top Chucks Angled side views of chocolate brown high top chucks. 86 Brown High Top Chucks Brown corduroy high top, left inside patch view. 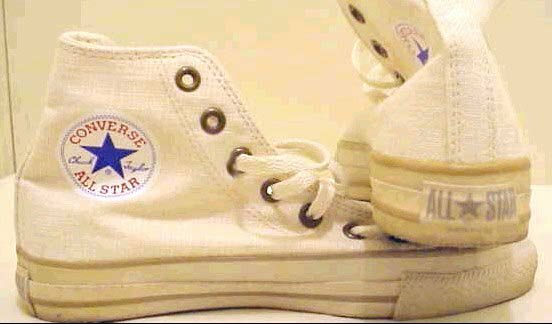 87 Brown High Top Chucks Khaki high top, left inside patch view. 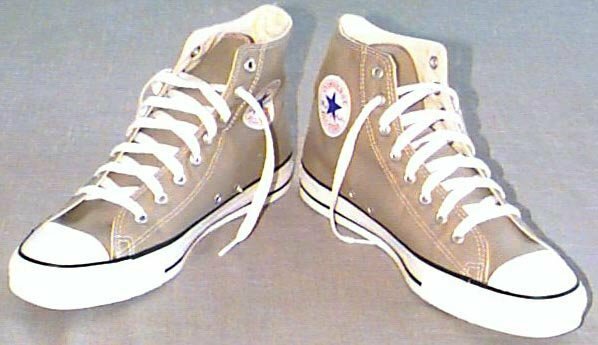 88 Brown High Top Chucks Khaki high top, left outside view. 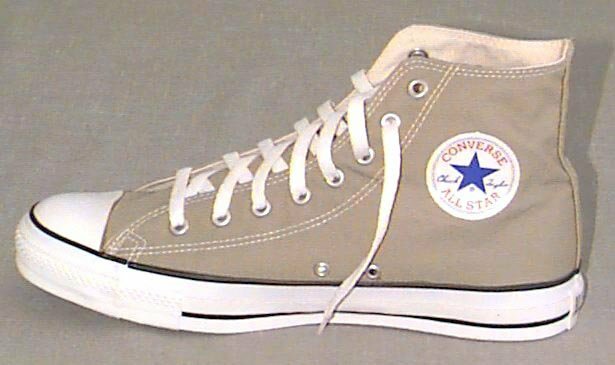 89 Brown High Top Chucks Khaki high top, right inside patch view. 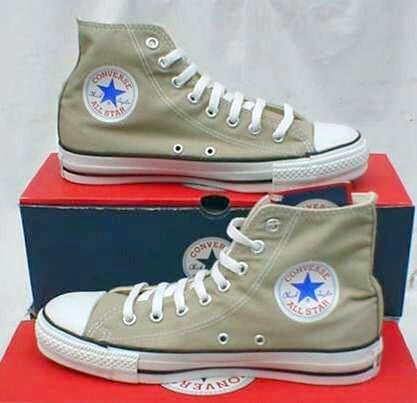 90 Brown High Top Chucks Right khaki high top, outside view. 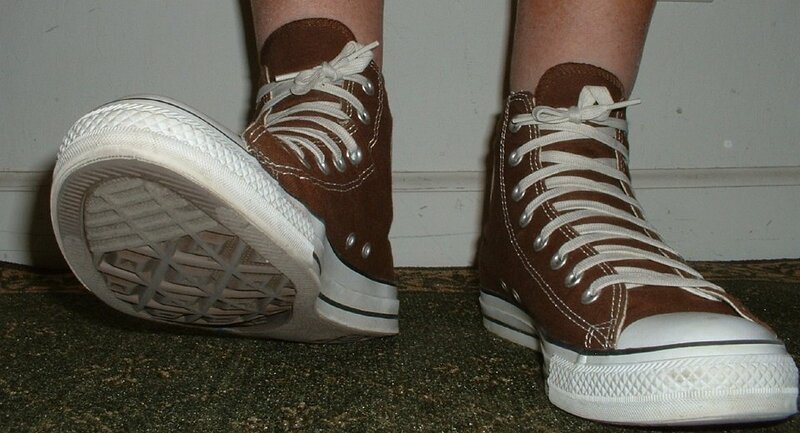 91 Brown High Top Chucks Khaki high tops, rear view. 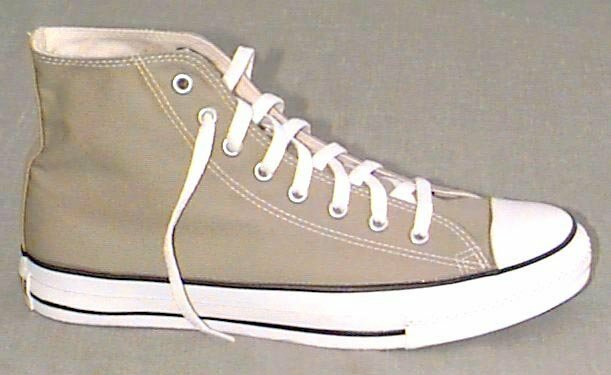 92 Brown High Top Chucks Flint khaki high tops, angled side view. 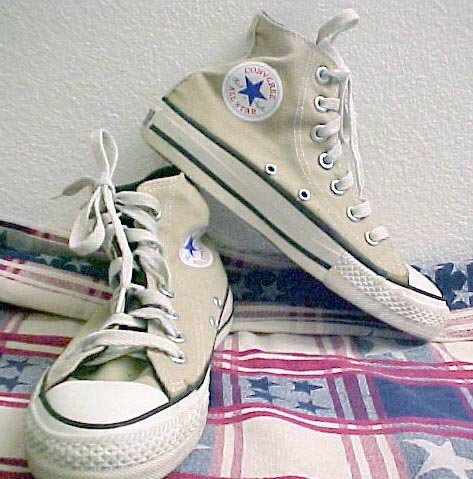 93 Brown High Top Chucks Khaki high tops, side views. 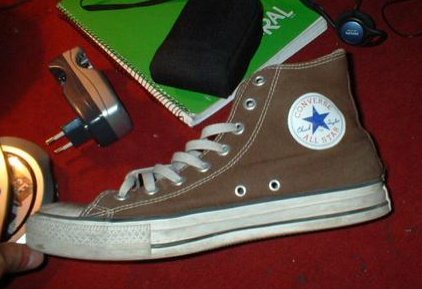 94 Brown High Top Chucks Khaki high tops, angled front view. 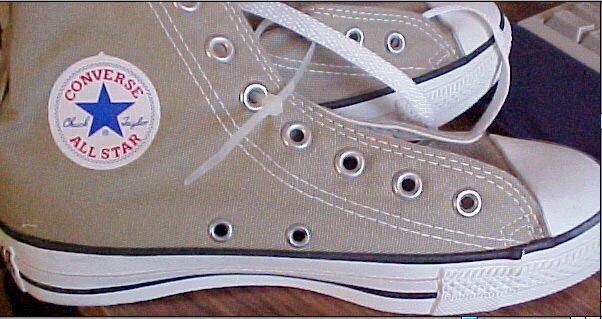 95 Brown High Top Chucks Flint khaki high tops, inside patch view. 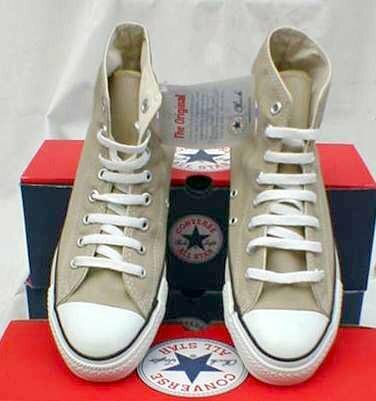 96 Brown High Top Chucks Flint khaki high tops, top view. 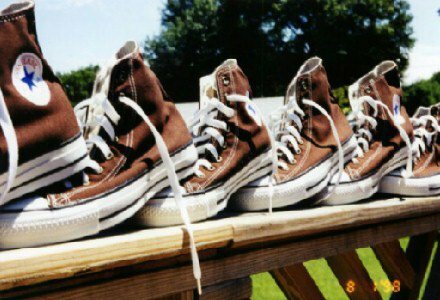 97 Brown High Top Chucks Flint khaki high tops, inside patch and front views. 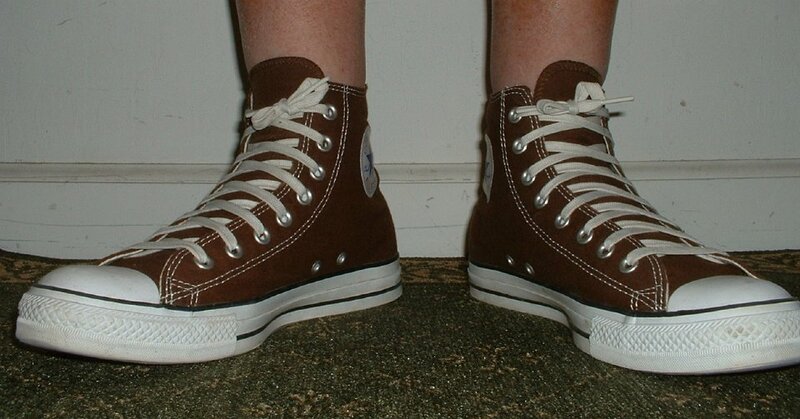 98 Brown High Top Chucks Flint khaki high tops, rear view. 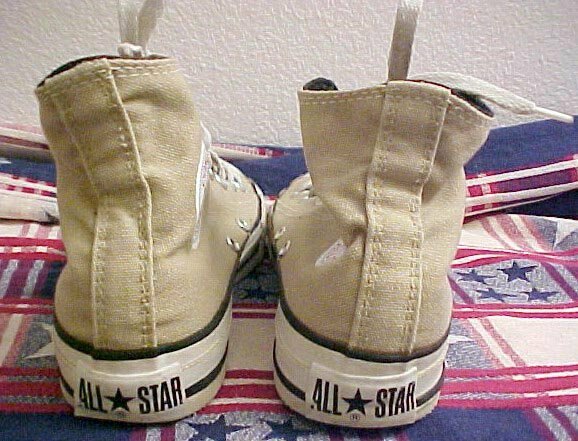 99 Brown High Top Chucks Flint khaki high top, angled right inside patch view. 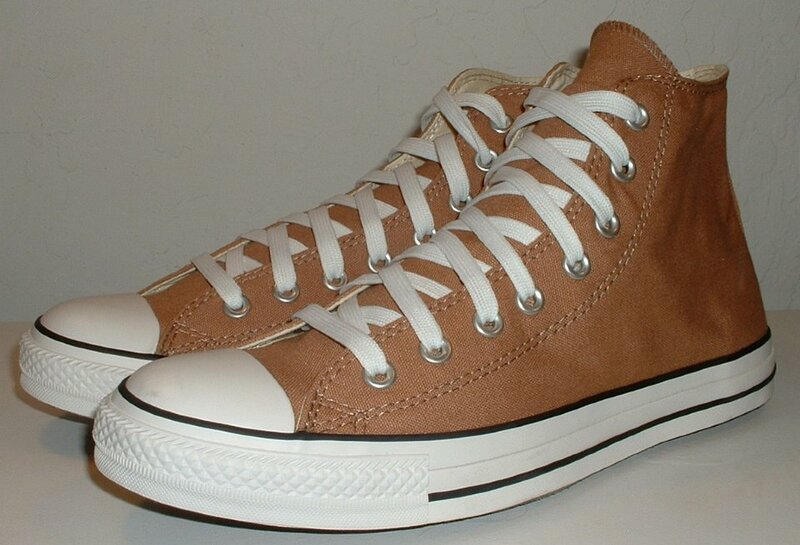 100 Brown High Top Chucks New tan high tops, side view one. 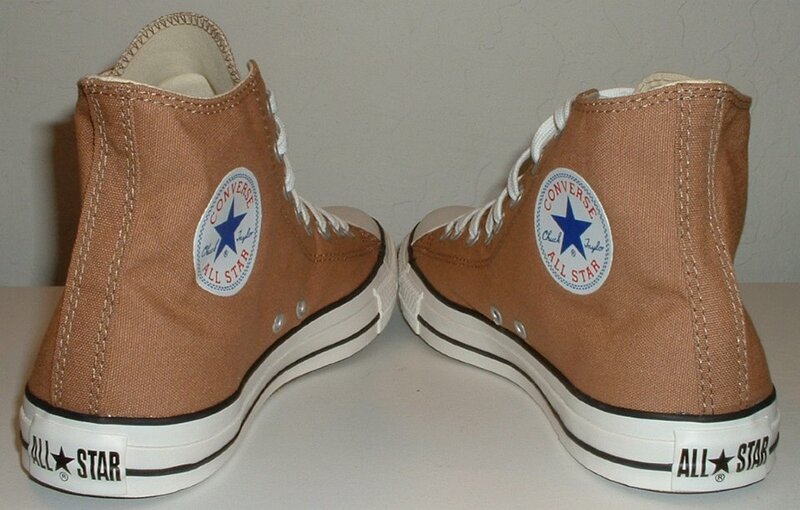 101 Brown High Top Chucks New tan high tops, side view two. 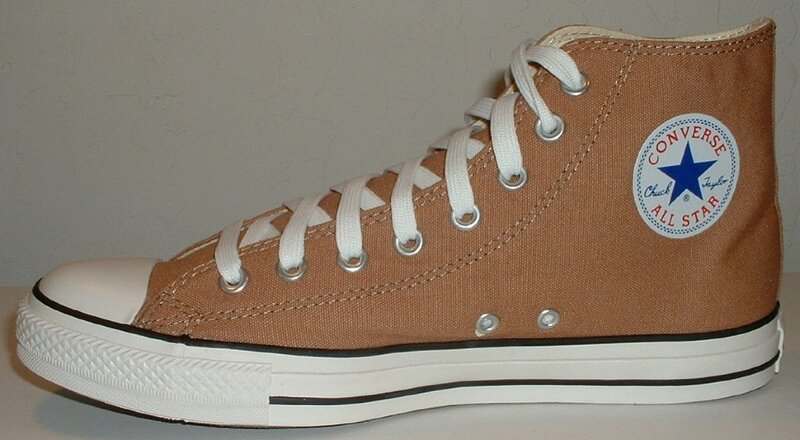 102 Brown High Top Chucks Inside patch view of a right tannin high top. 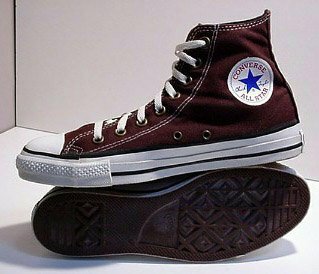 103 Brown High Top Chucks Outside view of a right tannin high top. 104 Brown High Top Chucks Inside patch view of a left tannin high top. 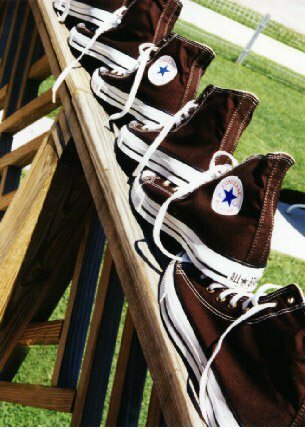 105 Brown High Top Chucks Outside view of a left tannin high top. 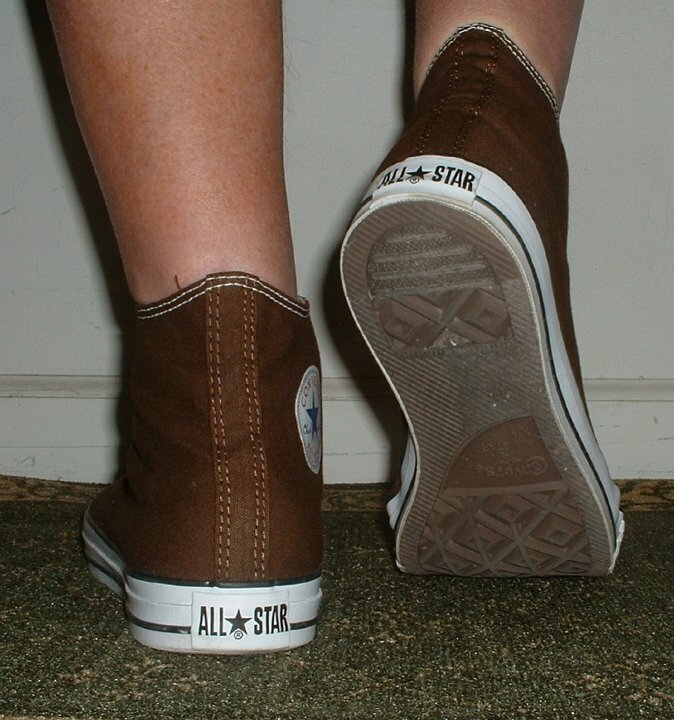 106 Brown High Top Chucks Rear view of tannin high tops. 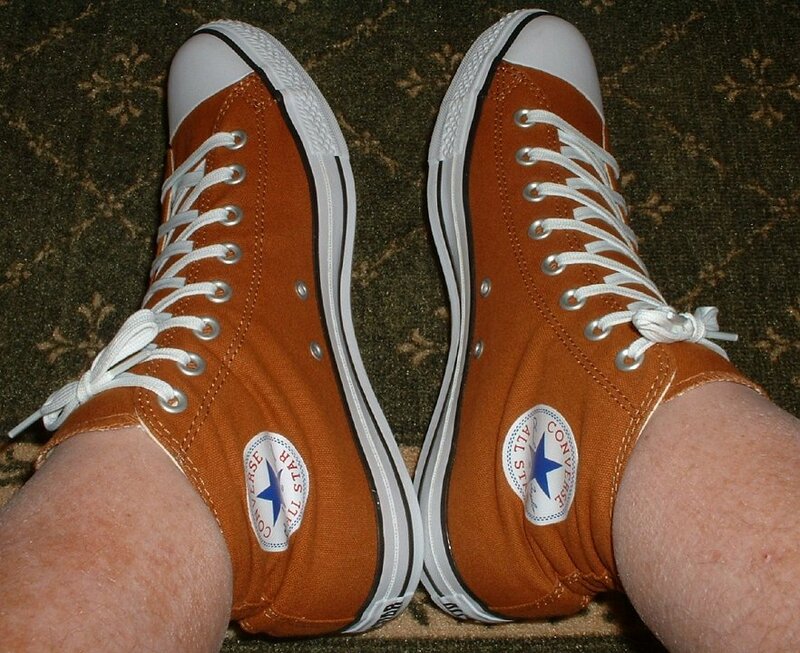 107 Brown High Top Chucks Angled rear view of tannin high tops. 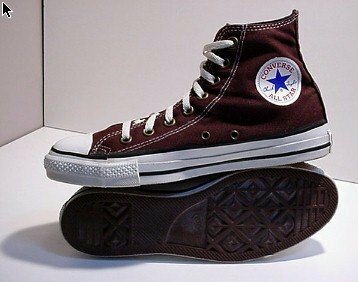 108 Brown High Top Chucks Angled side view of tannin high tops. 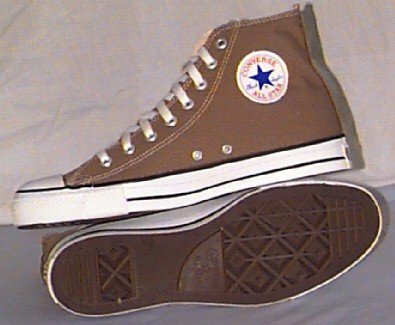 109 Brown High Top Chucks Front view of tannin high tops. 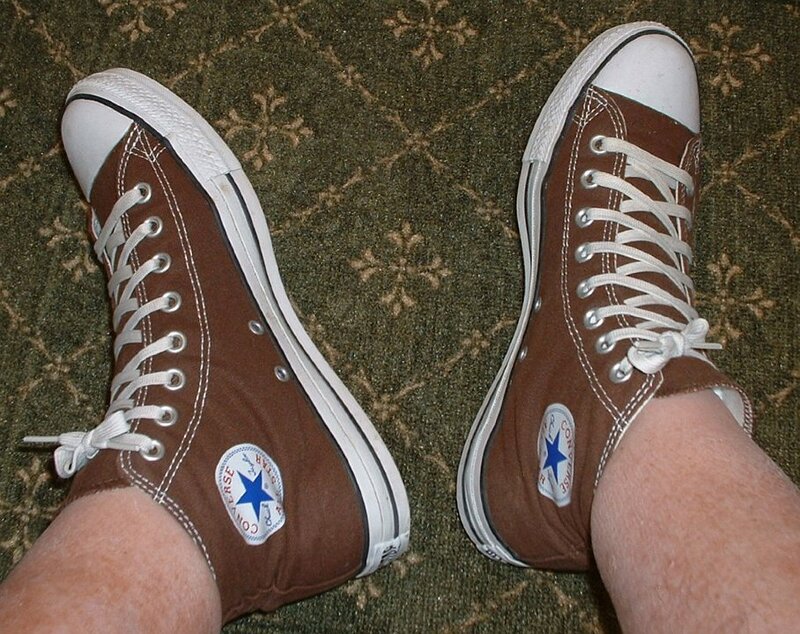 110 Brown High Top Chucks Angled front view of tannin high tops. 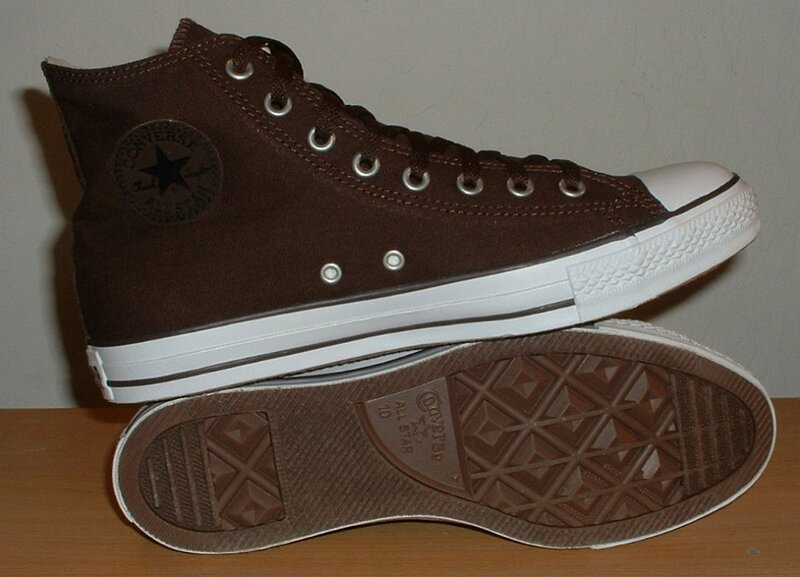 111 Brown High Top Chucks Inside patch views of tannin high tops. 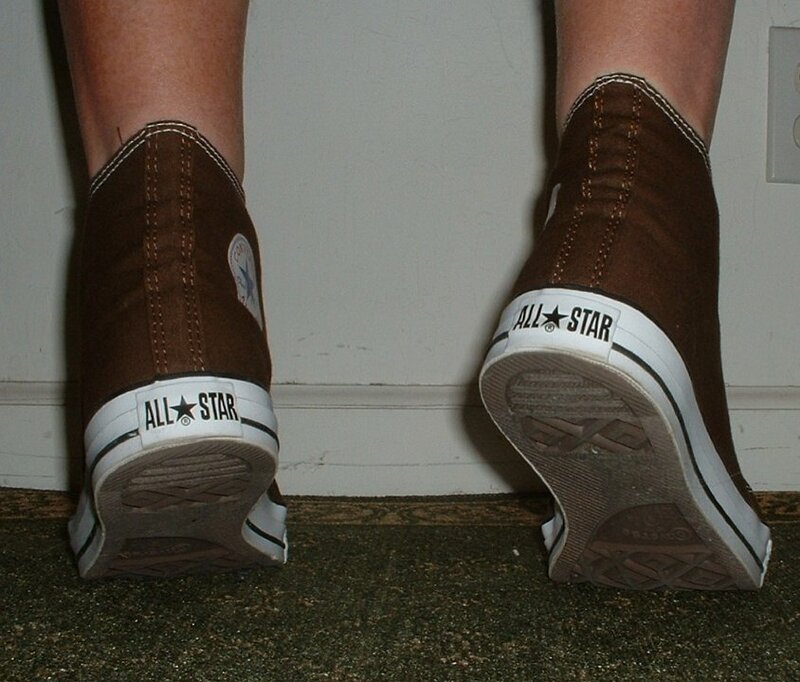 112 Brown High Top Chucks Top view of tannin high tops. 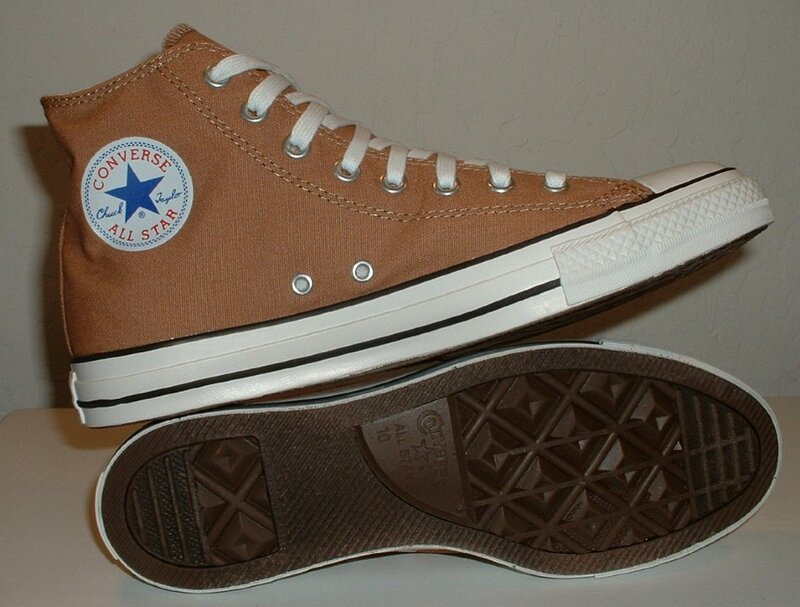 113 Brown High Top Chucks Inside patch and sole views of tannin high tops. 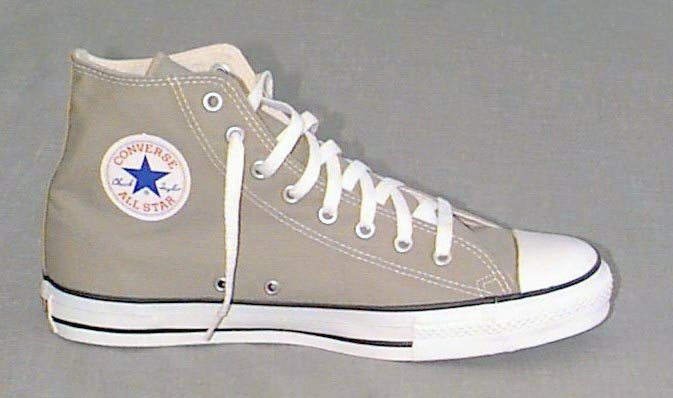 114 Brown High Top Chucks Taupe high tops, side view. 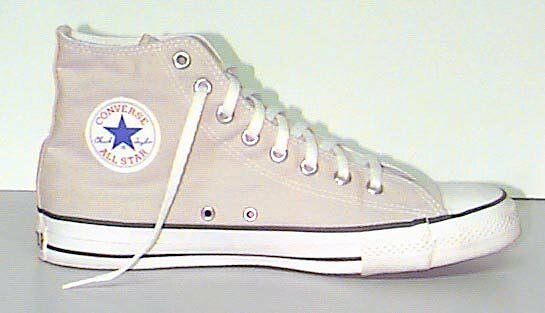 115 Brown High Top Chucks Taupe high tops, right inside patch and sole views. 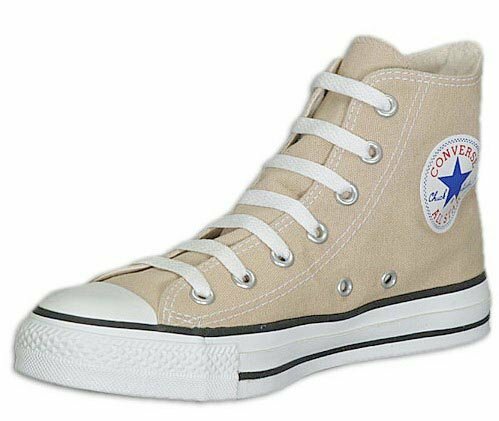 116 Brown High Top Chucks Taupe high tops, front and rear views. 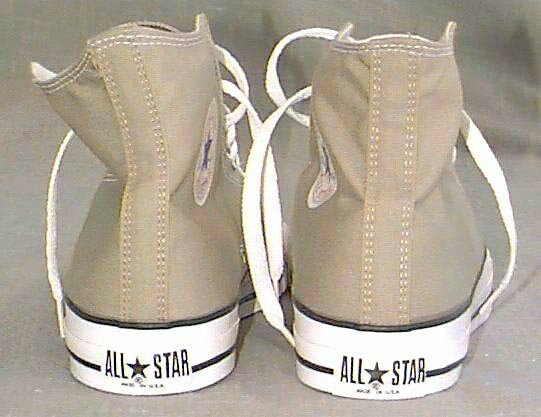 117 Brown High Top Chucks Taupe high tops, angled front view. 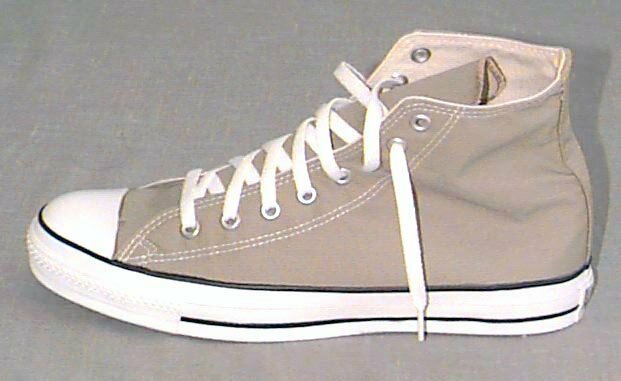 118 Brown High Top Chucks Left taupe high top, outside view. 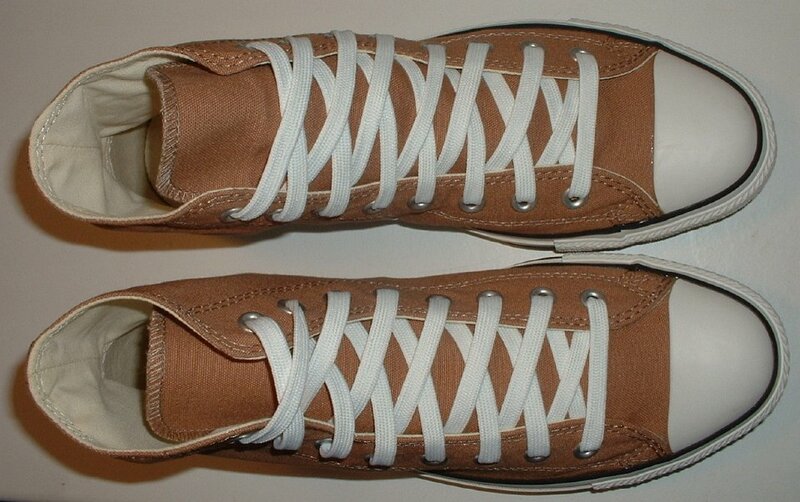 119 Brown High Top Chucks Left taupe high top, left inside patch view. 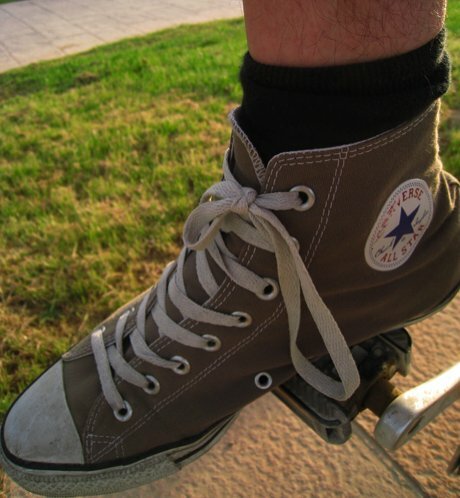 120 Brown High Top Chucks Pedaling in taupe high tops. 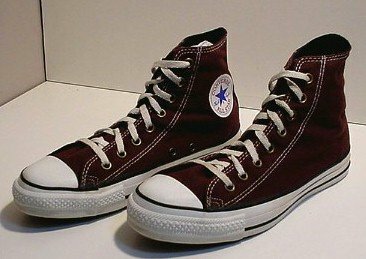 121 Brown High Top Chucks Wearing chocolate high tops. 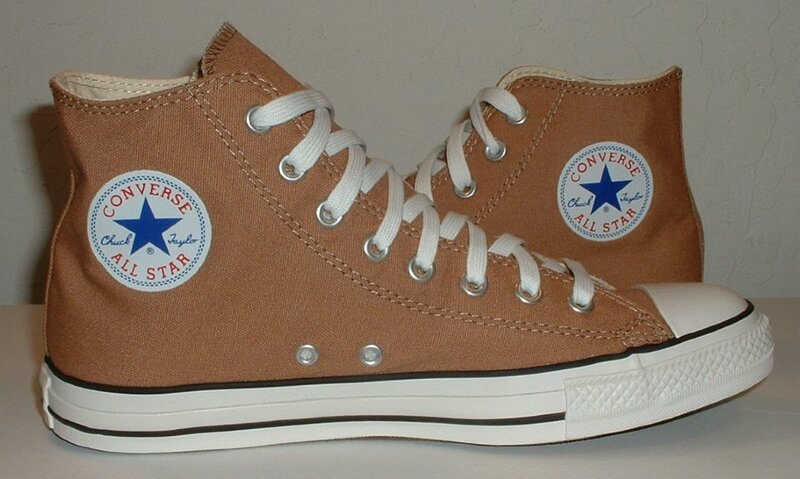 122 Brown High Top Chucks Wearing chocolate high tops, inside patch views. 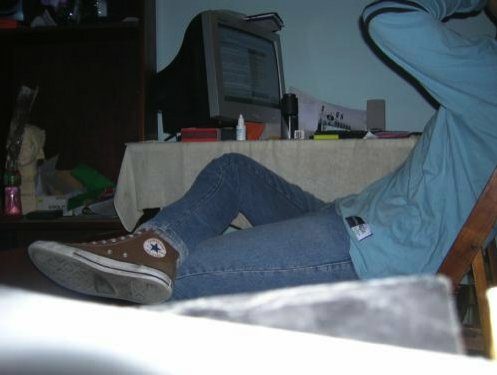 123 Brown High Top Chucks Wearing chocolate high tops, legs crossed. 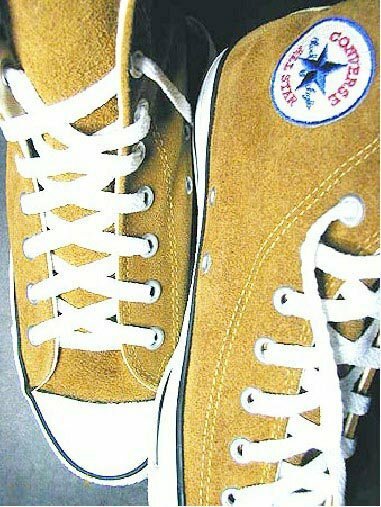 124 Brown High Top Chucks Wearing chocolate high tops, inside patch view 2. 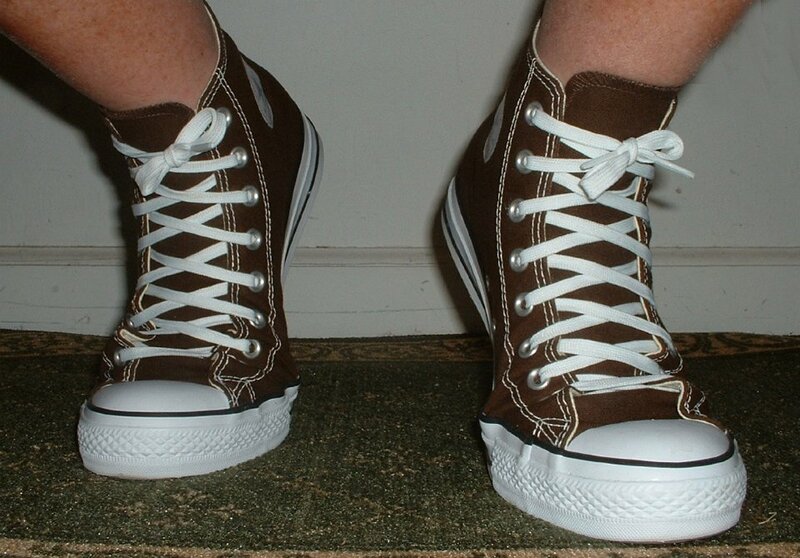 125 Brown High Top Chucks Wearing chocolate high tops, front view shot 1. 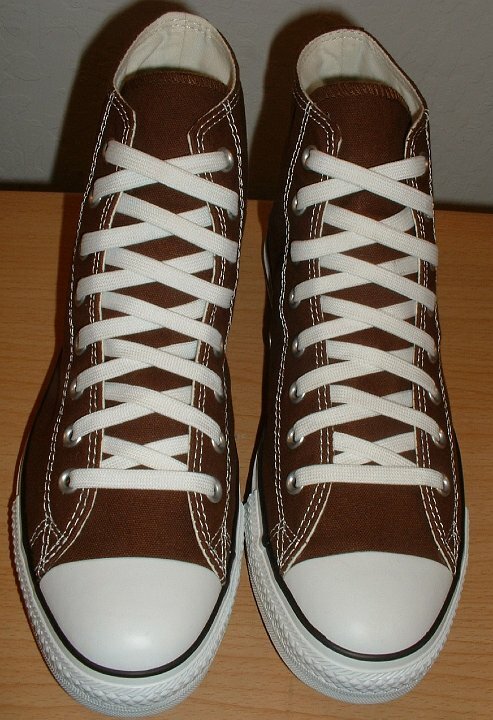 126 Brown High Top Chucks Wearing chocolate high tops, front view shot 2. 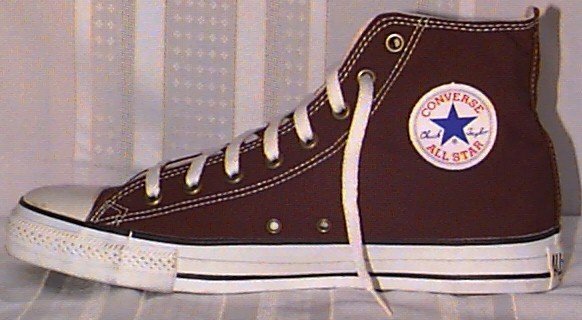 127 Brown High Top Chucks Wearing chocolate high tops, front view shot 3. 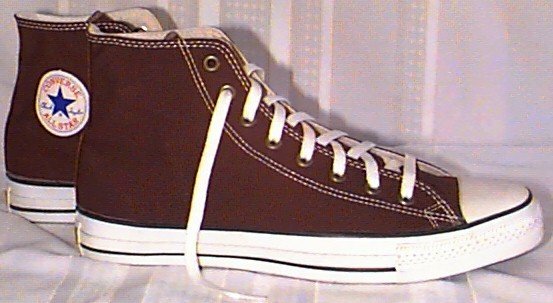 128 Brown High Top Chucks Wearing chocolate brown high tops, front view shot 4. 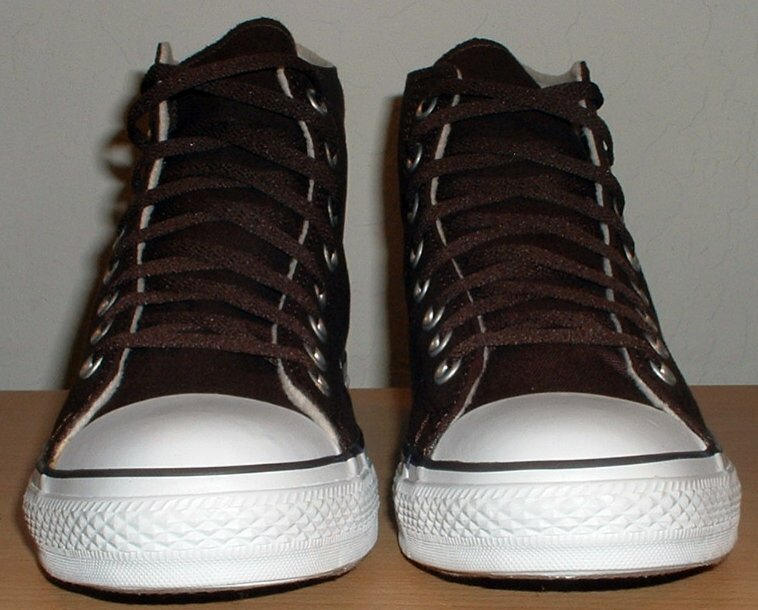 129 Brown High Top Chucks Wearing chocolate brown high tops, front view shot 5. 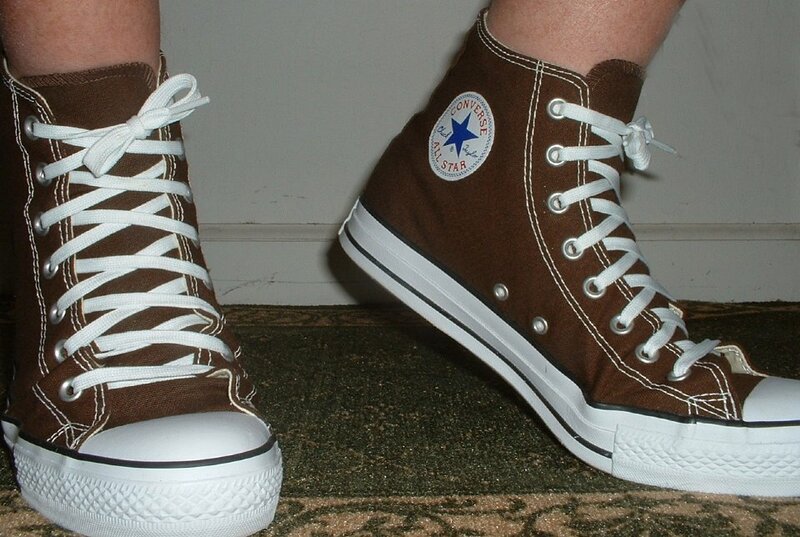 130 Brown High Top Chucks Wearing chocolate brown high tops, front view shot 6. 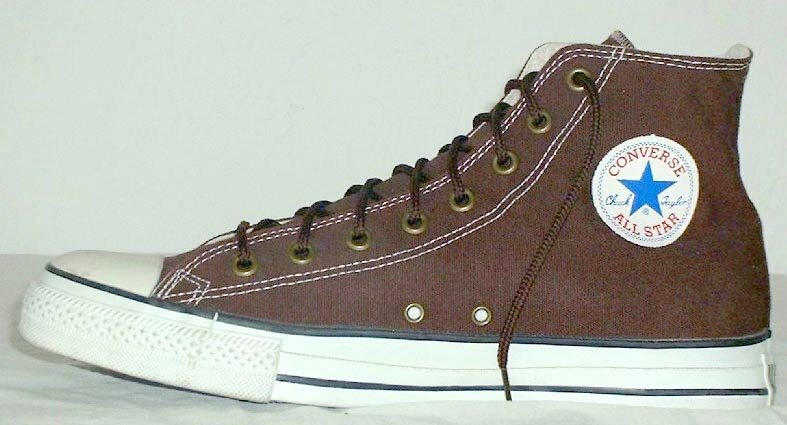 131 Brown High Top Chucks Wearing chocolate brown high tops, front view shot 7. 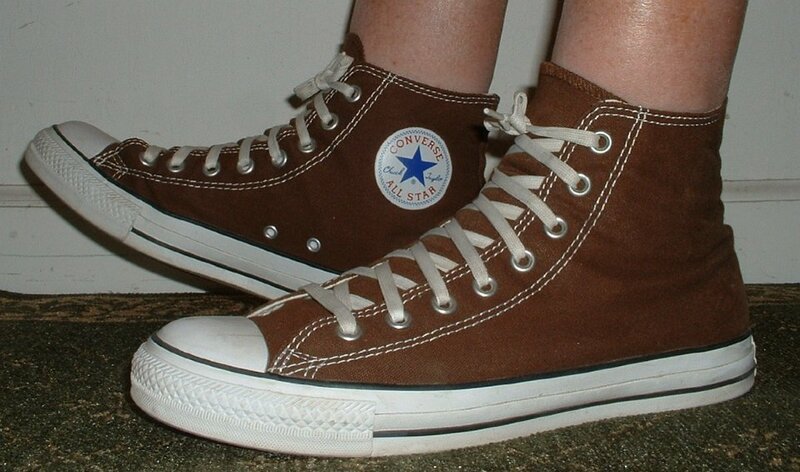 132 Brown High Top Chucks Wearing chocolate brown high tops, front view shot 6. 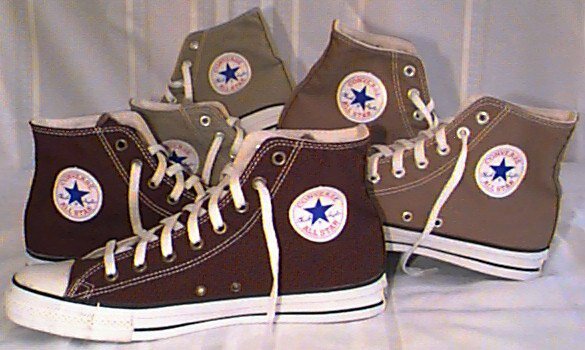 133 Brown High Top Chucks Wearing chocolate high tops, left side view. 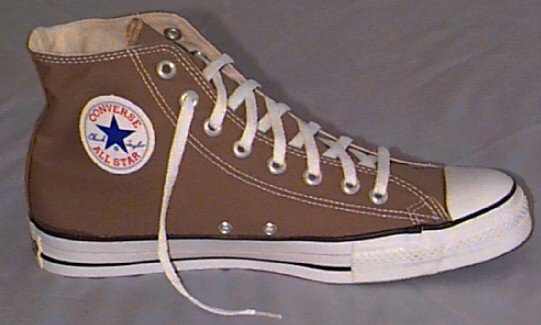 134 Brown High Top Chucks Wearing chocolate high tops, left side view 2. 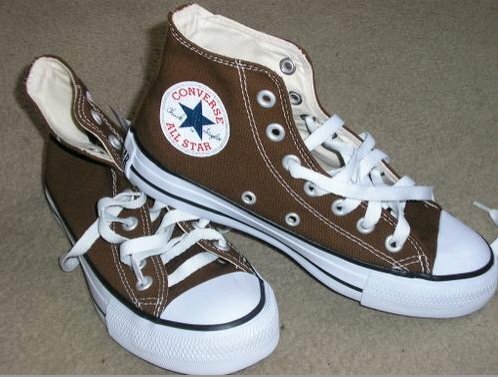 135 Brown High Top Chucks Wearing chocolate brown high tops, fleft side view shot 3. 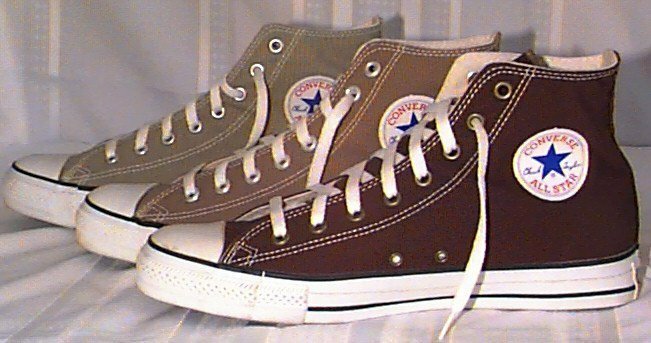 136 Brown High Top Chucks Wearing chocolate brown high tops, left side view shot 4. 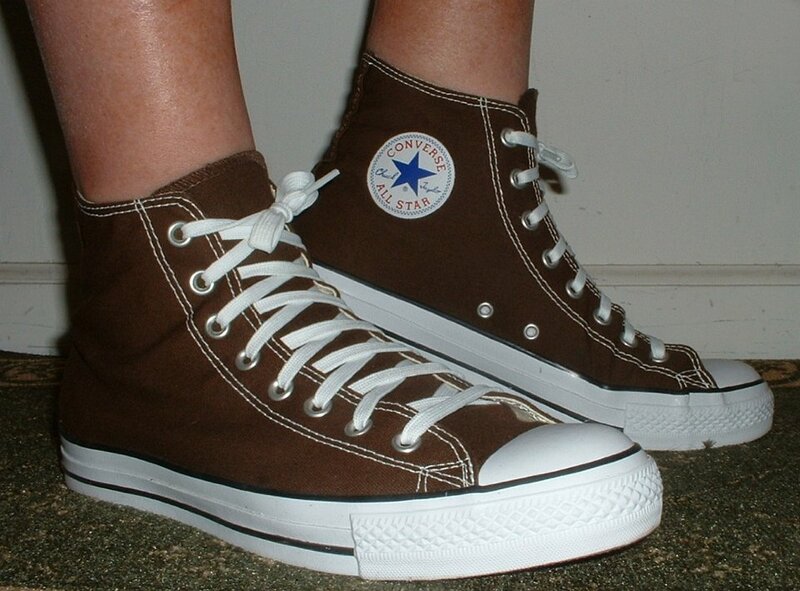 137 Brown High Top Chucks Wearing chocolate brown high tops, rear view shot 1. 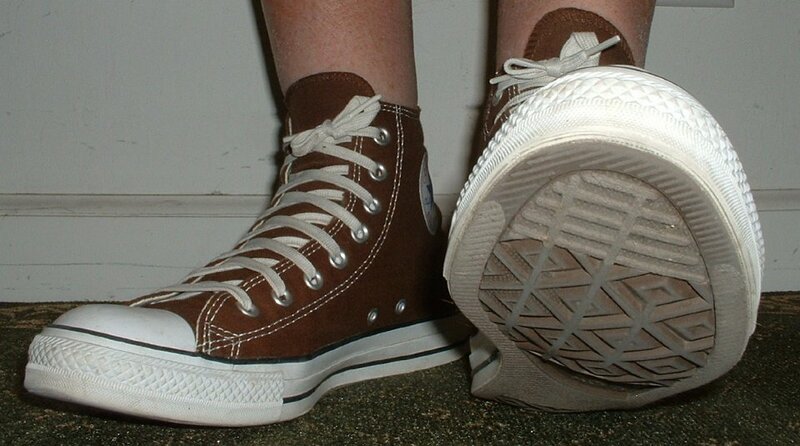 138 Brown High Top Chucks Wearing chocolate brown high tops, rear view shot 2. 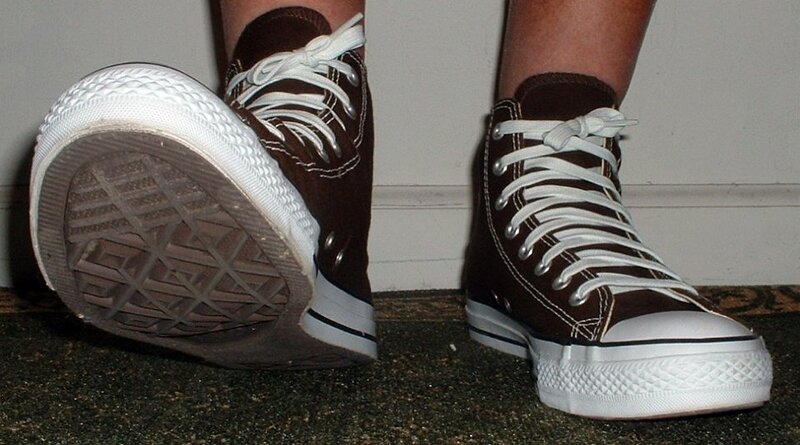 139 Brown High Top Chucks Wearing chocolate high tops, rear view shot 3. 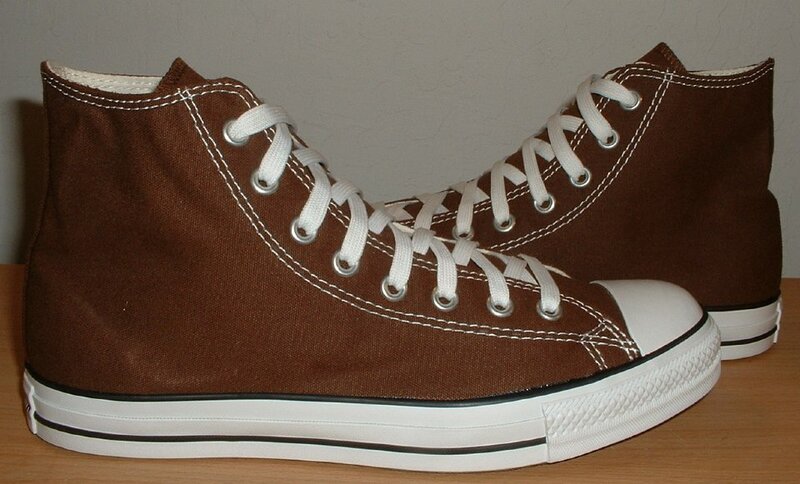 140 Brown High Top Chucks Wearing chocolate high tops, rigth side view. 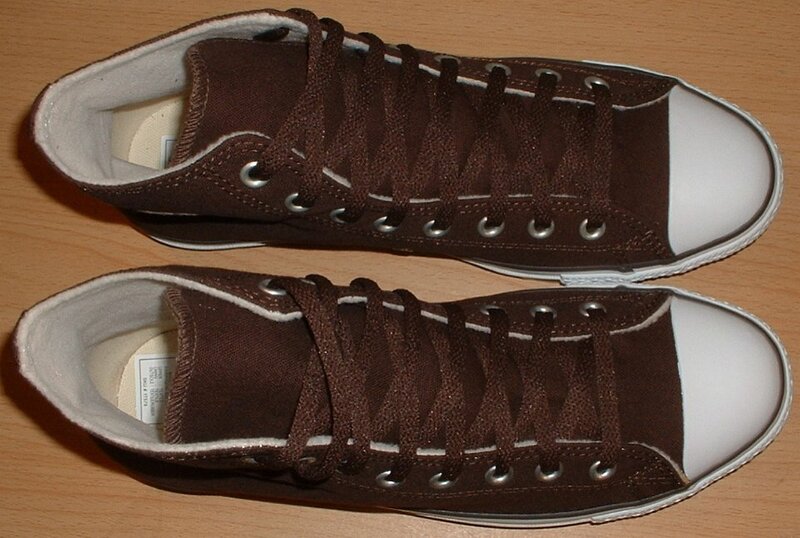 141 Brown High Top Chucks Wearing chocolate brown high tops, right side view shot 2. 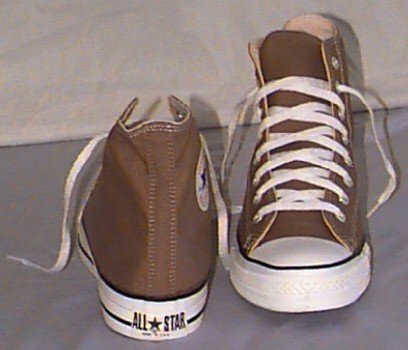 142 Brown High Top Chucks Wearing chocolate high tops, left side view. 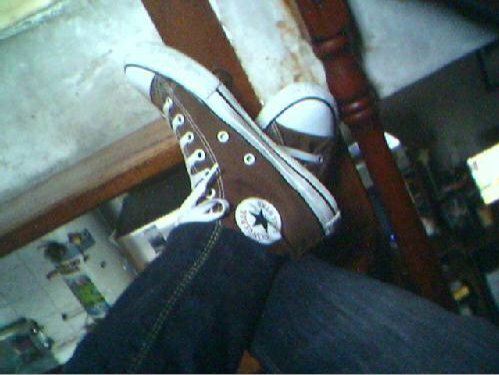 143 Brown High Top Chucks Seated wearing worn choclate high tops. 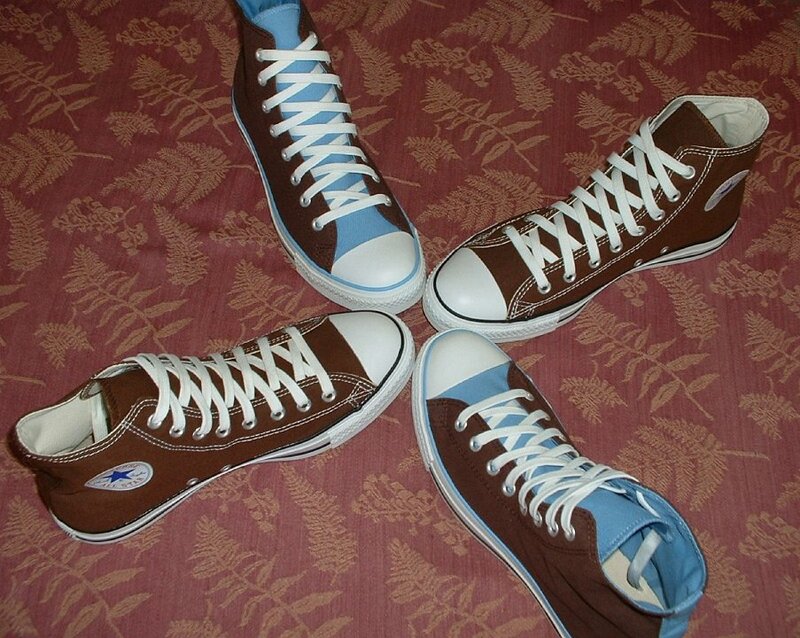 144 Brown High Top Chucks Wearing Carolina blue and chocolate brown high tops. 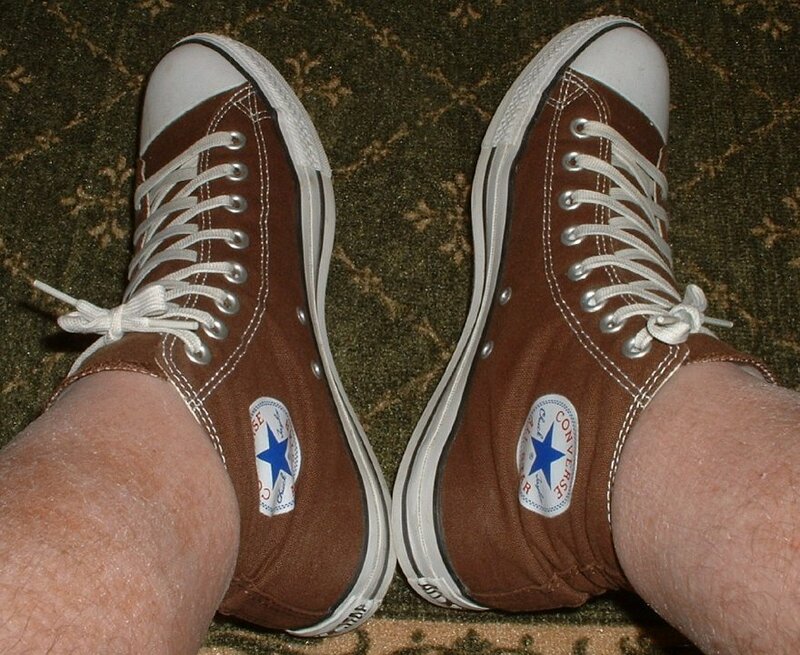 145 Brown High Top Chucks Wearing chocolate high tops, crossed leg view. 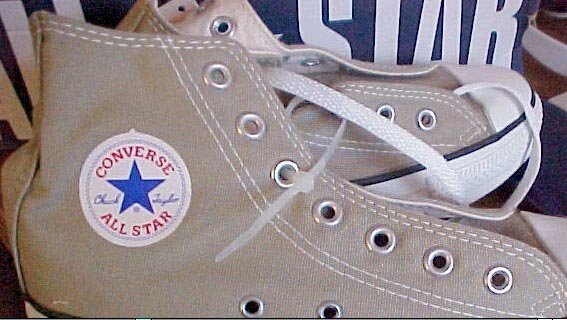 146 Brown High Top Chucks Wearing Sienna brown high tops, inside patch view. 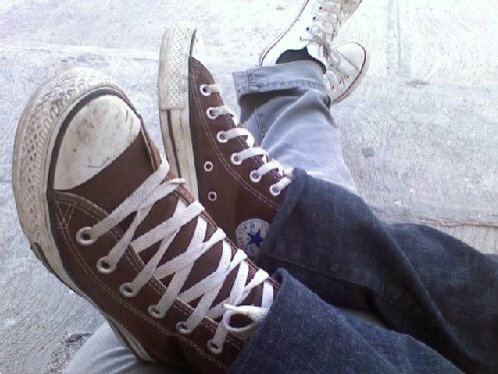 147 Brown High Top Chucks Wearing Sienna brown high tops, crossed legs view. 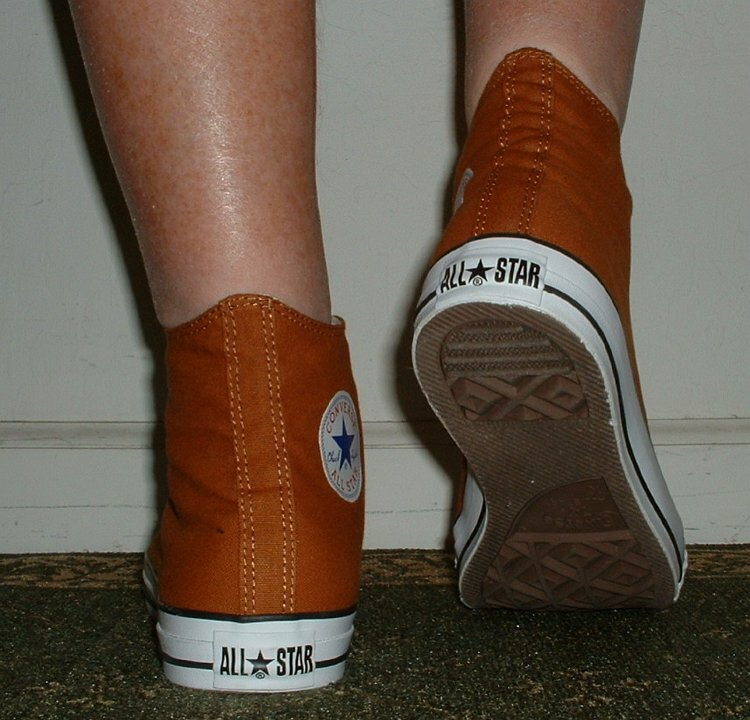 148 Brown High Top Chucks Wearing Sienna brown high tops, inside patch view 2. 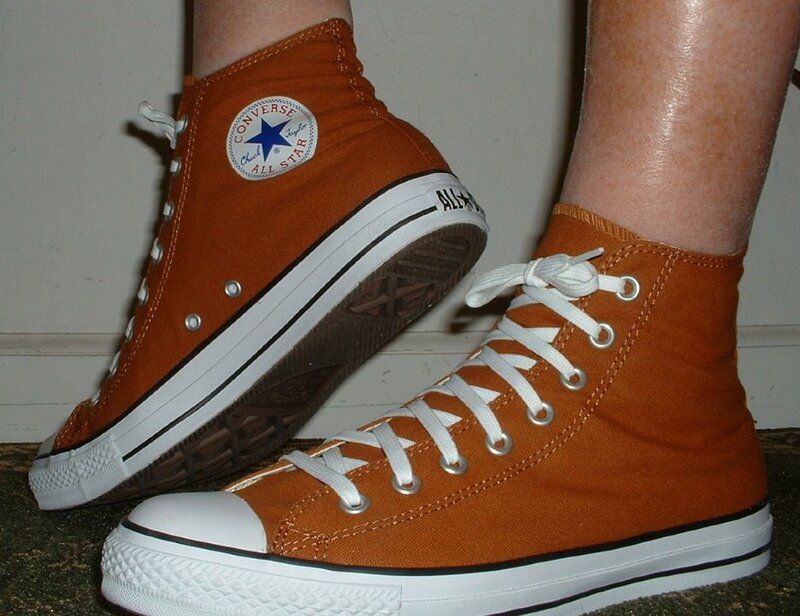 149 Brown High Top Chucks Wearing Sienna brown high tops, front view. 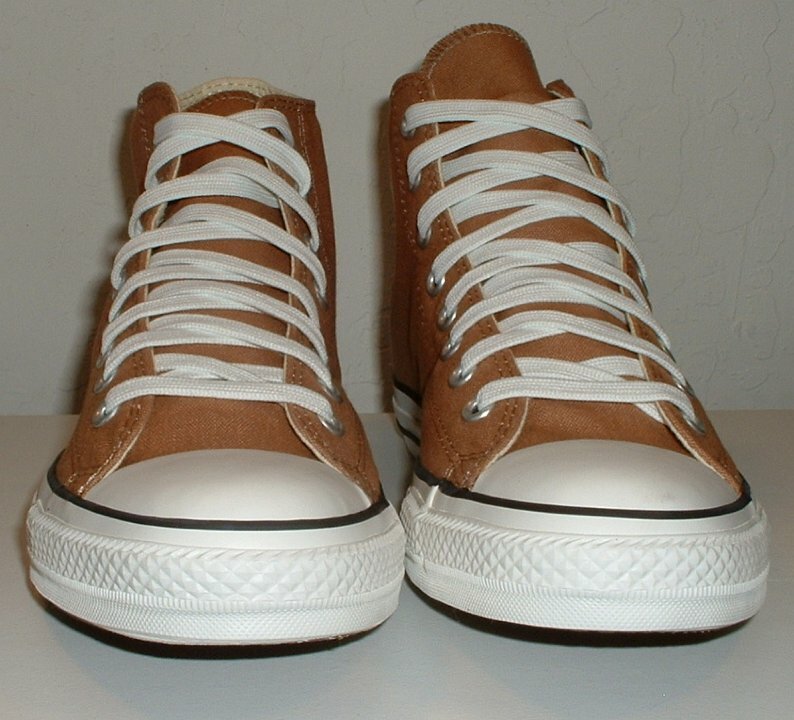 150 Brown High Top Chucks Wearing Sienna brown high tops, front view 2. 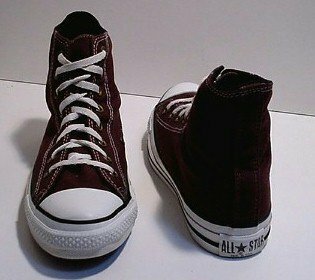 151 Brown High Top Chucks Wearing Sienna brown high tops, front view 3. 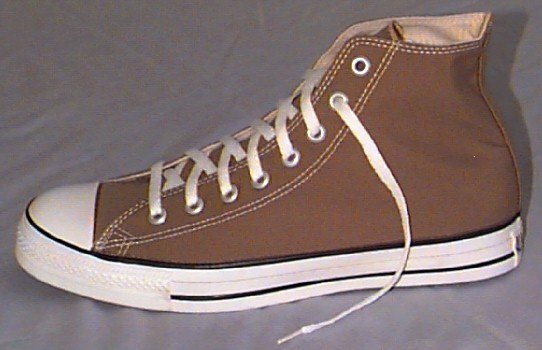 152 Brown High Top Chucks Wearing Sienna brown high tops, left side view. 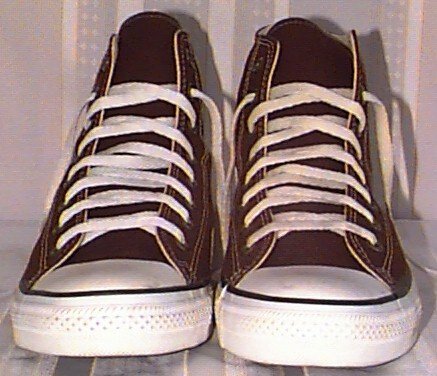 153 Brown High Top Chucks Wearing Sienna brown high tops, front view 3. 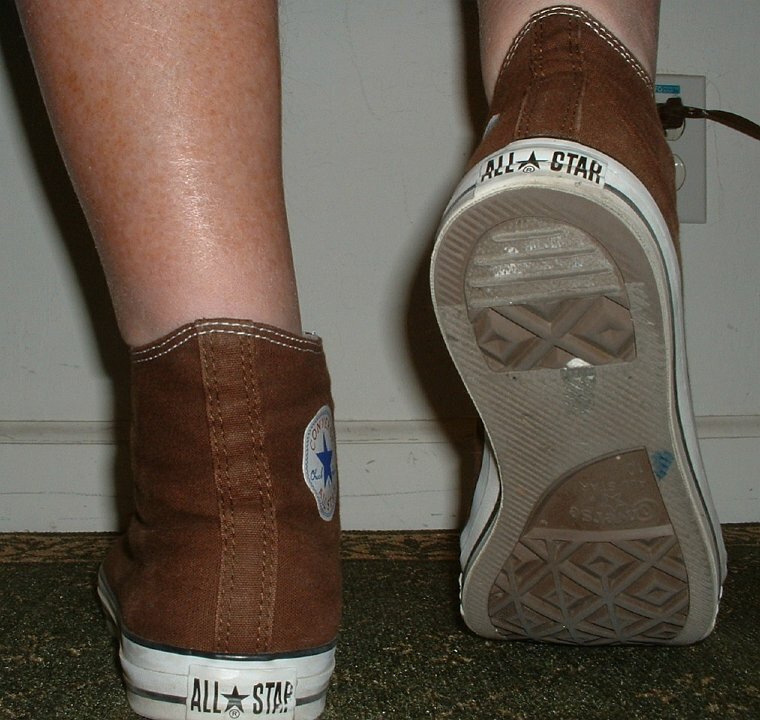 154 Brown High Top Chucks Wearing Sienna brown high tops,rear view 1. 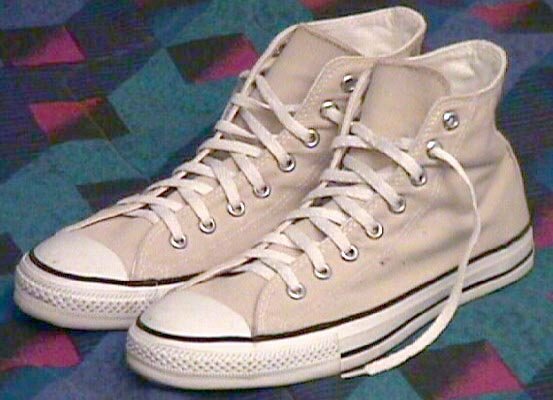 155 Brown High Top Chucks Wearing Sienna brown high tops, rear view 2. 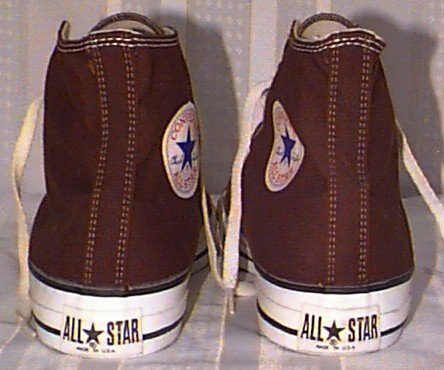 156 Brown High Top Chucks Wearing Sienna brown high tops, right side view 1. 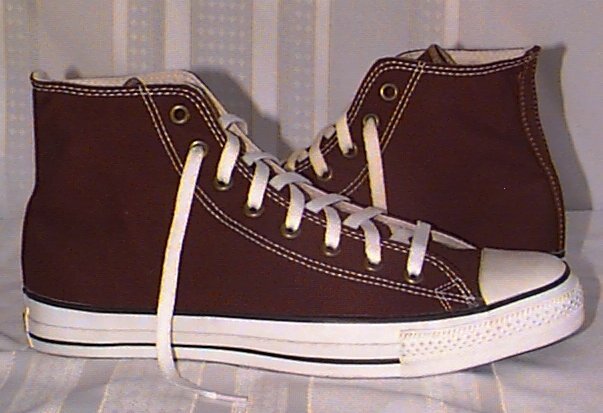 157 Brown High Top Chucks Wearing Sienna brown high tops, right side view 2. 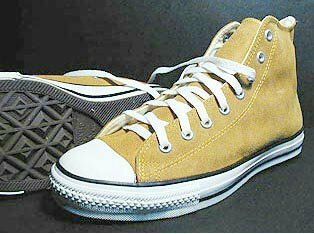 158 Brown High Top Chucks Wheat high tops, inside patch and rear views. 159 Brown High Top Chucks Wheat high tops, inside patch view.